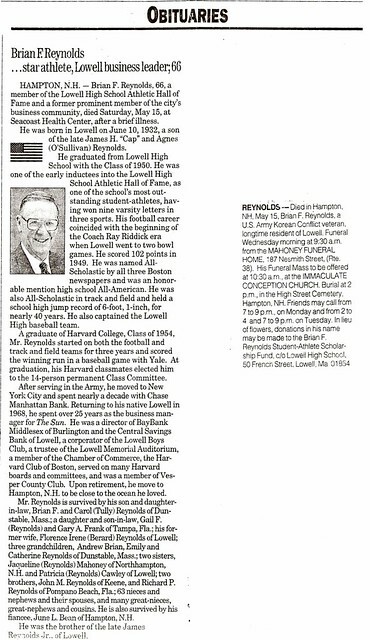 Coached by three Lowell High School Hall of Fame members, Brian Reynolds obviously learned his lessons effectively, winning All-Scholastic honors in football (under Ray Riddick), track (under George “Mike” Haggerty), and baseball (under Stan Stoklosa). 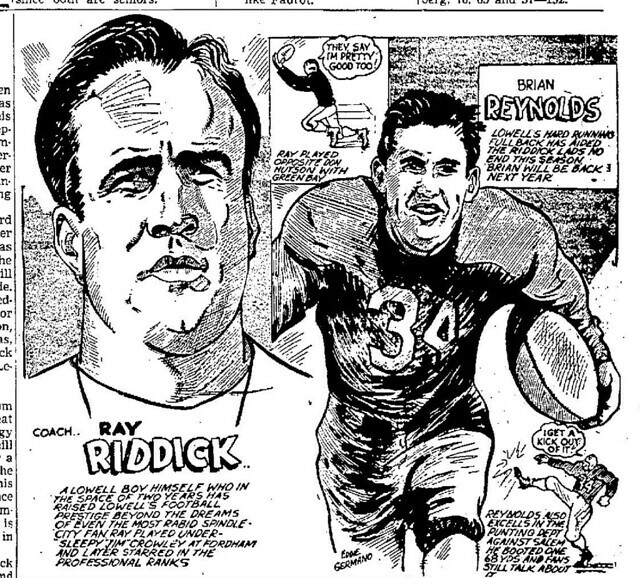 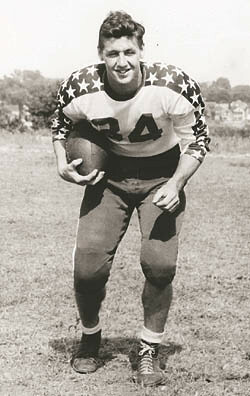 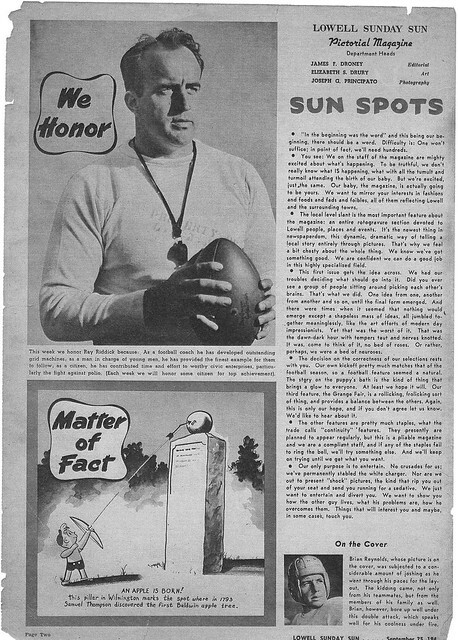 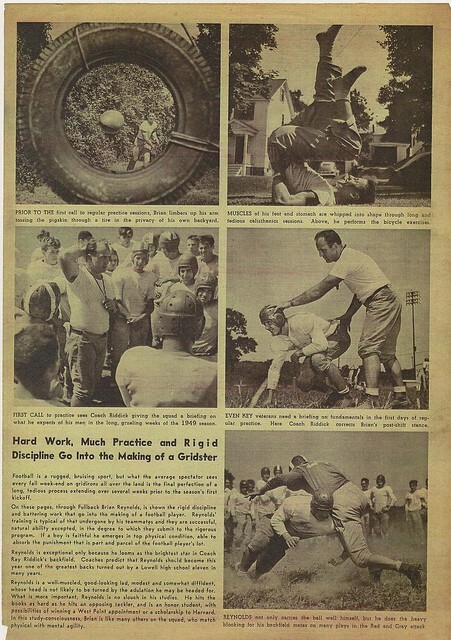 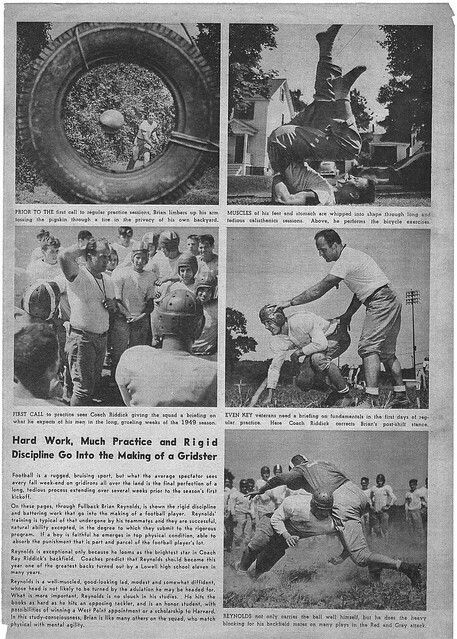 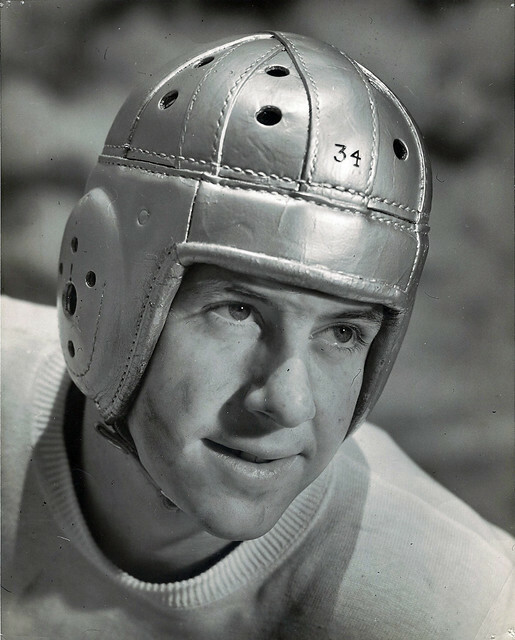 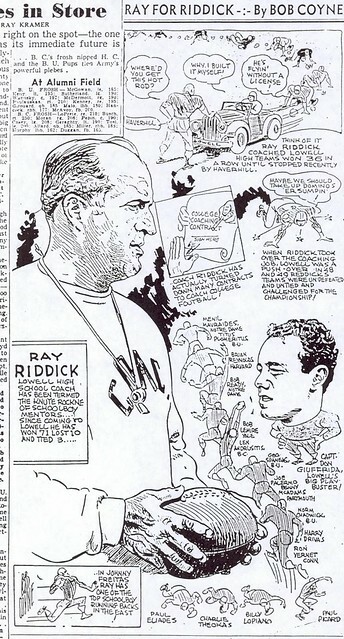 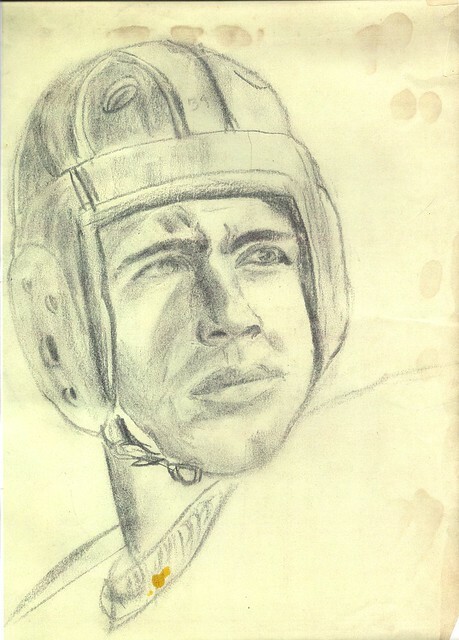 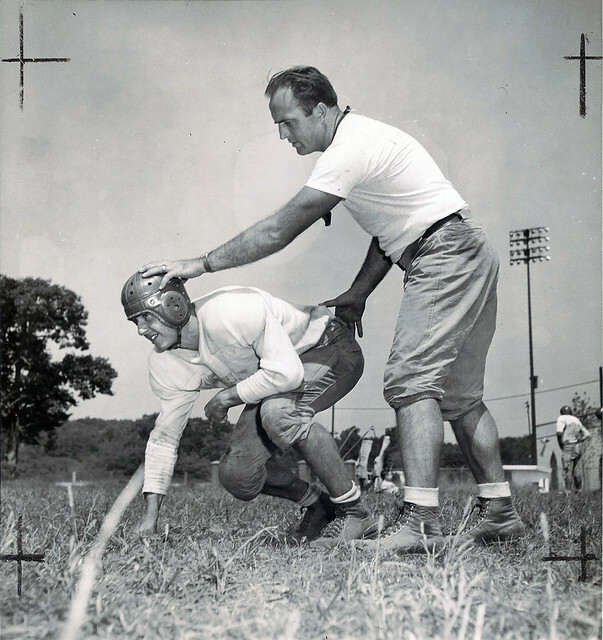 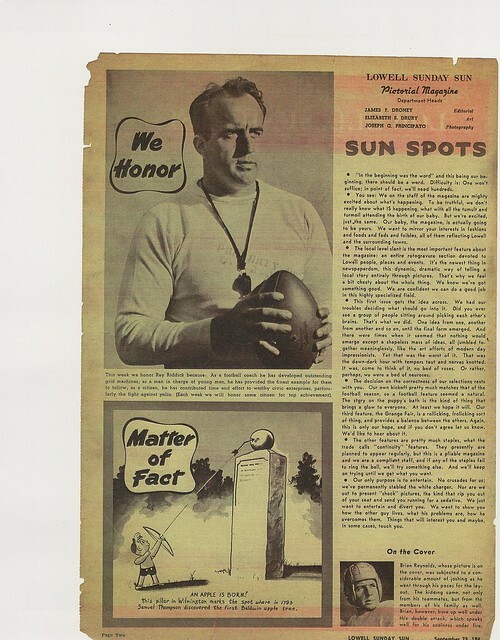 On the gridiron, Brian was a mainstay on the Ray Riddick powerhouses from 1947–1949. 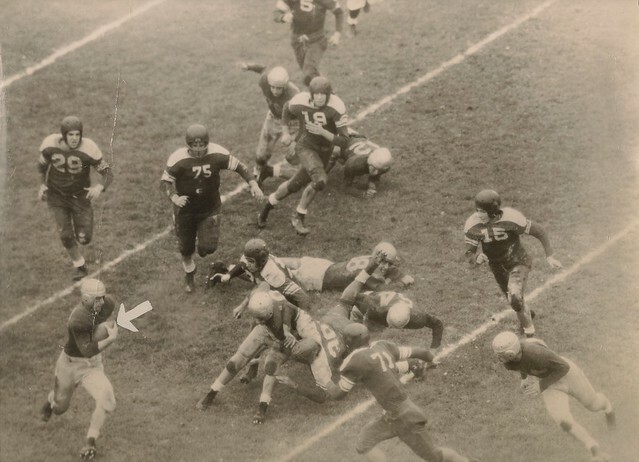 As a senior fullback he totaled 102 points, including a memorable 3 touchdown performance against Lawrence in the famous 55–0 Thanksgiving Day victory over the Lancers. 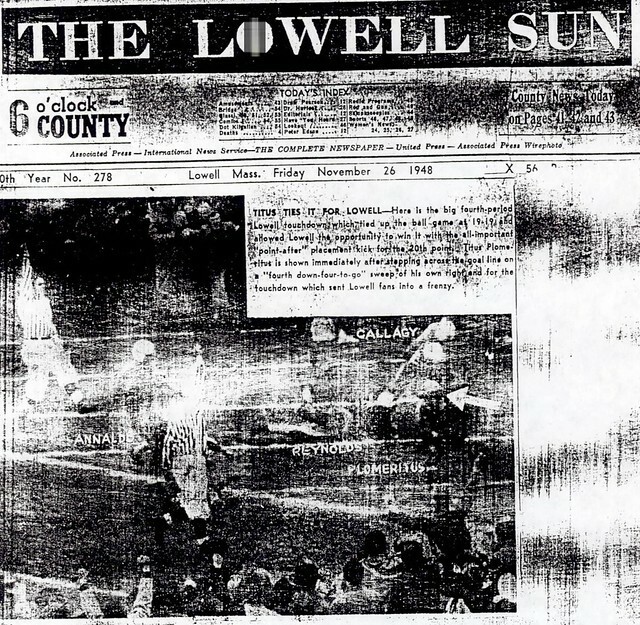 Lowell later capped an undefeated Eastern Mass Class A Championship with a victory in the Gator Bowl. 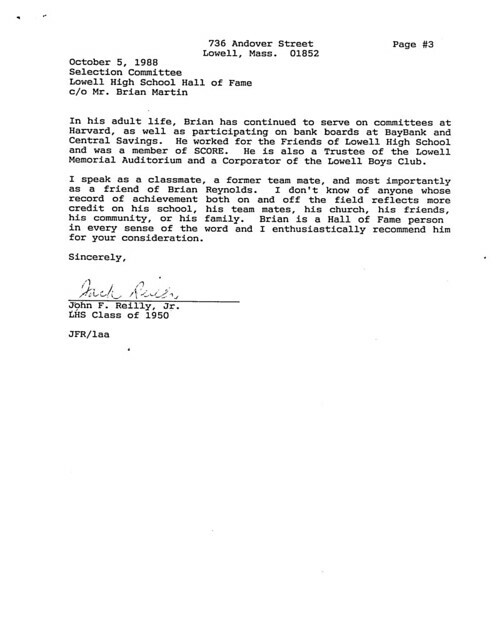 As a member of the track team, Brian was a standout high jumper/hurdler. 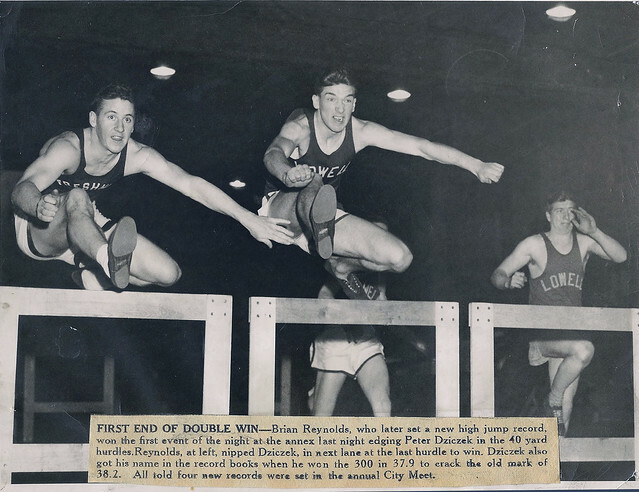 His school record of 6’1″ in the high jump stood for 39 years. 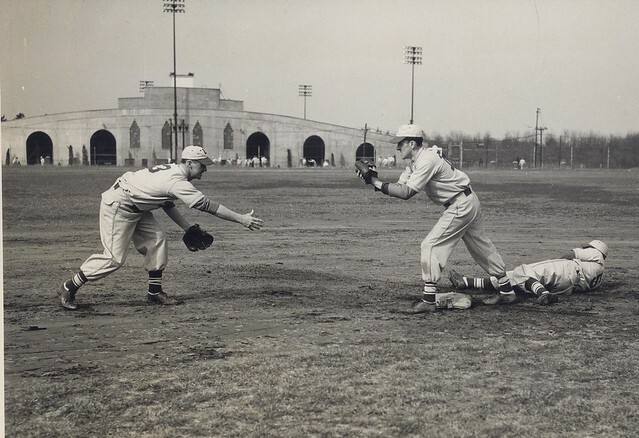 In the Spring Brian focused his talents on baseball, serving as Captain of the Red & Gray nine as an outfielder/shortstop. 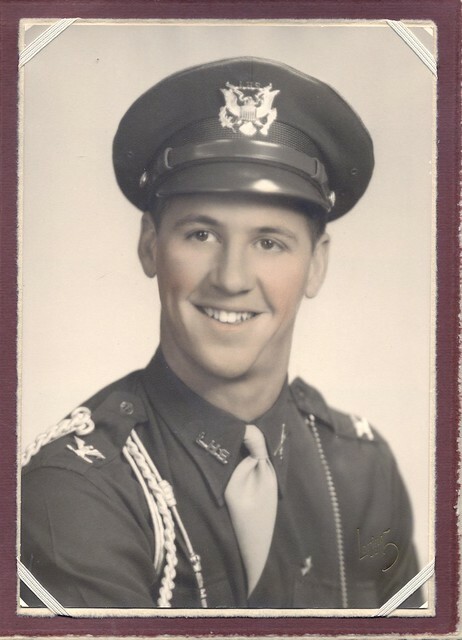 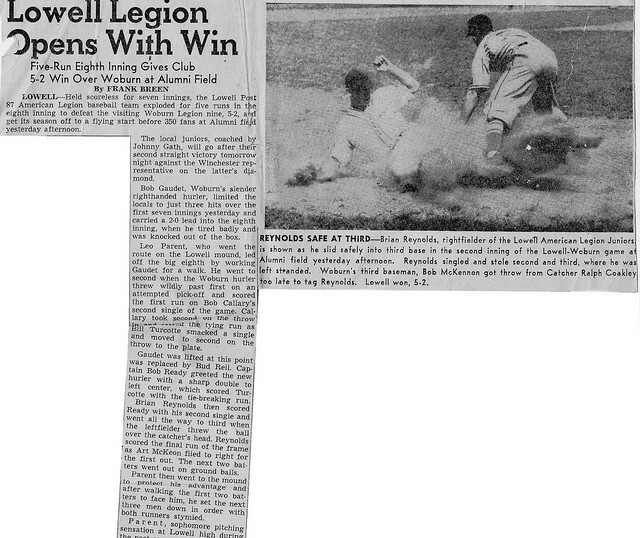 He also hit over .400 as a member of Lowell’s American Legion Baseball unit. 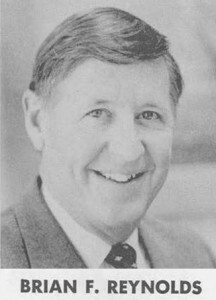 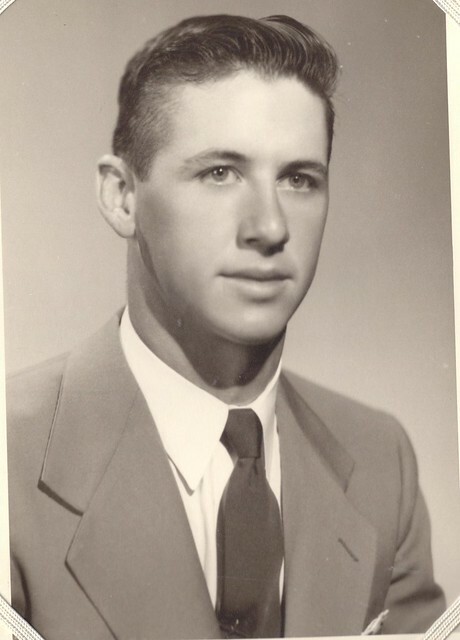 After graduation, Brian attended Harvard University, graduating in the Class of 1954. 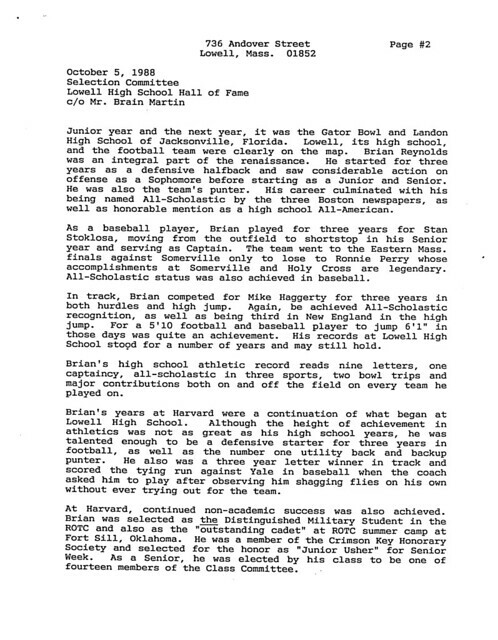 He continued an outstanding athletic career as a varsity letter winner in both football and track. 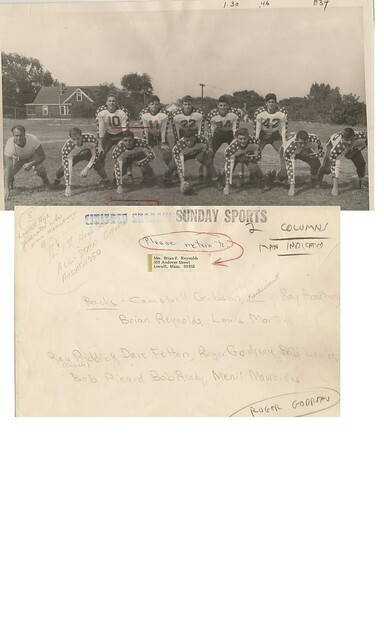 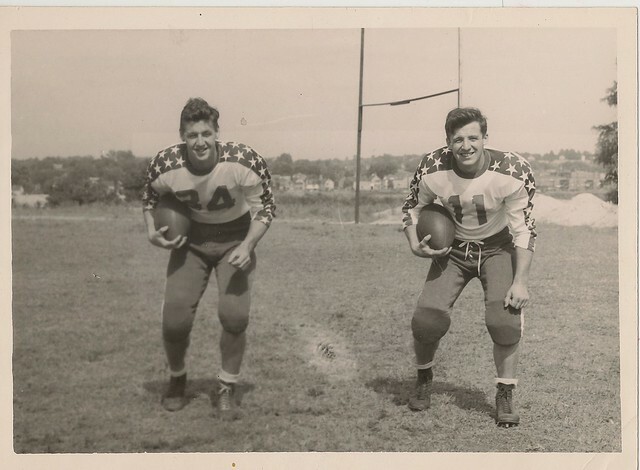 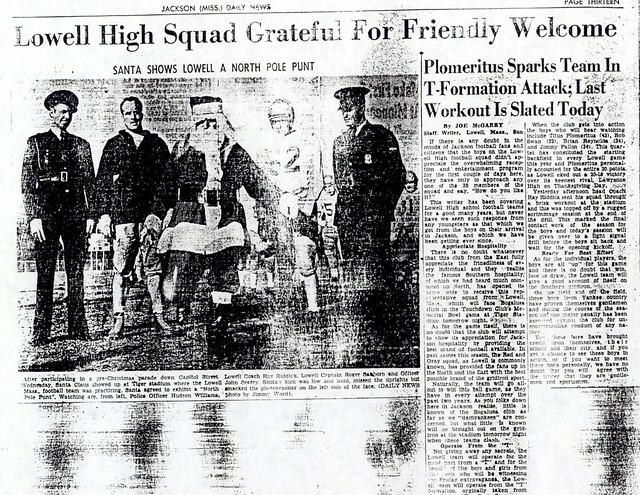 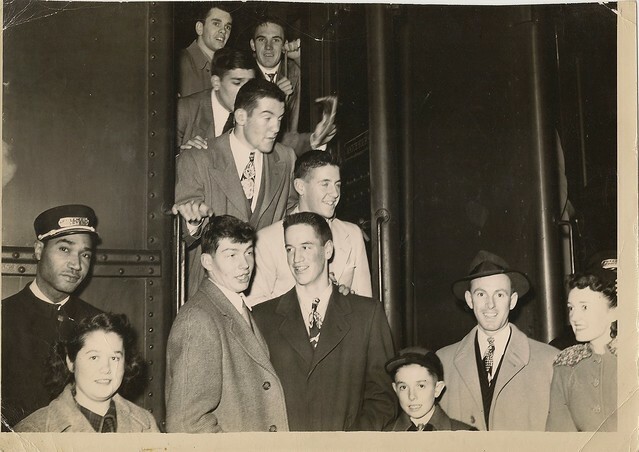 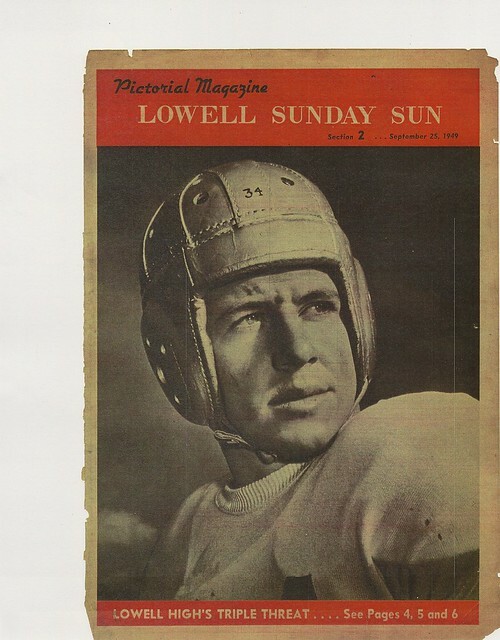 ‘ALL-AMERICAN BOY’: Suited up for the Lowell Sun Charities All-Star Football Game in 1950. 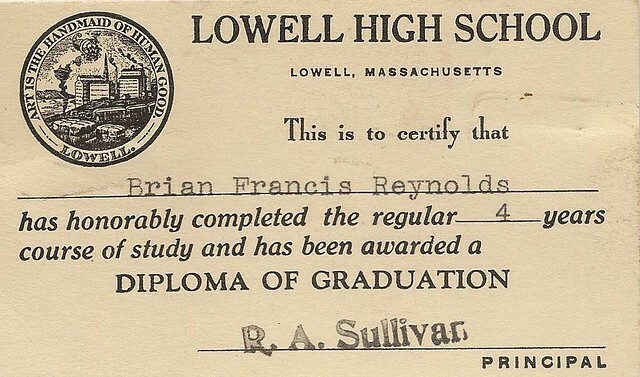 LOWELL — As an athlete, Brian Reynolds was a natural. 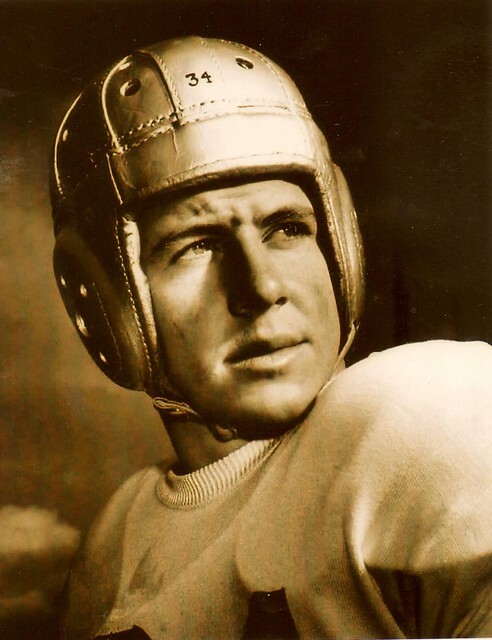 Anchored in the virtues of the 1940s, he played like he had been sent back from the faster future. 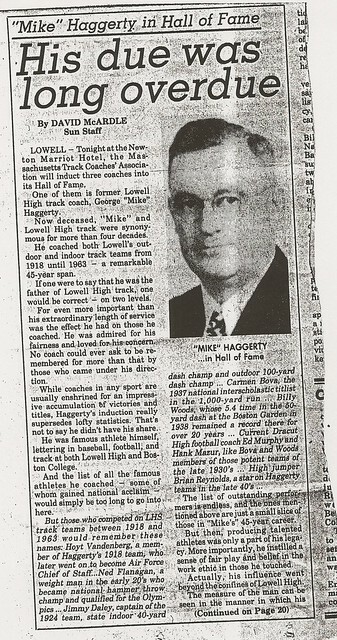 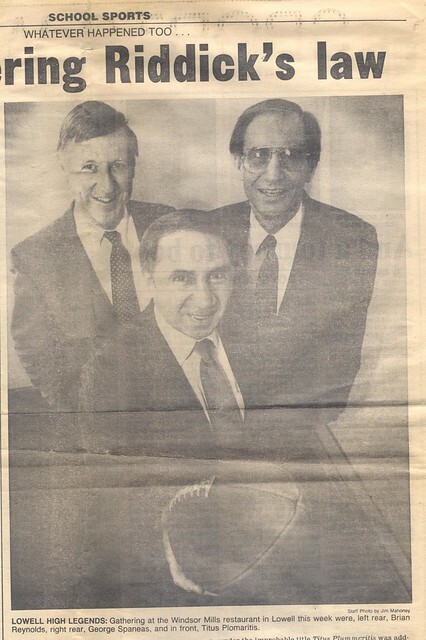 The Lowell High Hall of Famer was humble, obedient and hard-working. 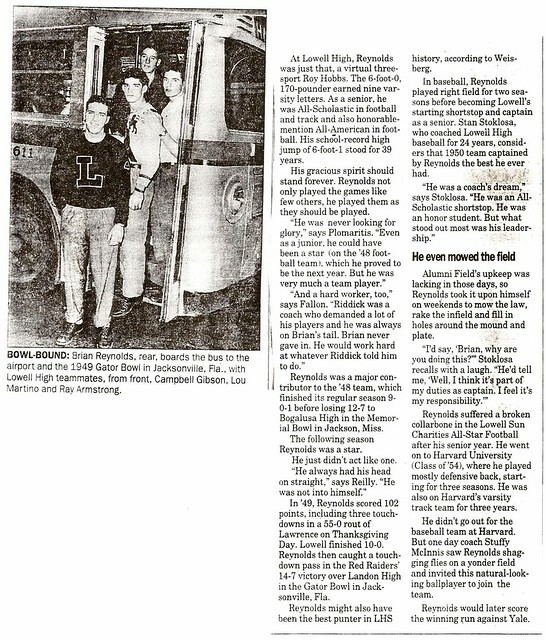 And he once scored three touchdowns against Lawrence, probably using that shocking spin move that all the great running backs use now. 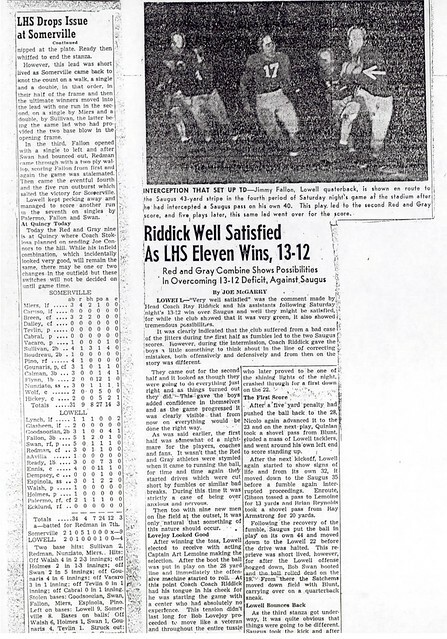 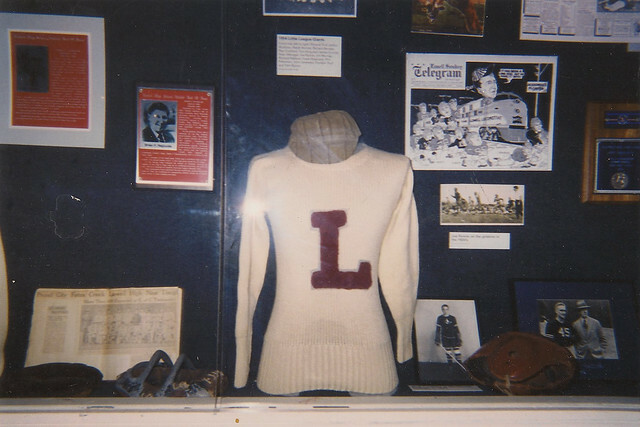 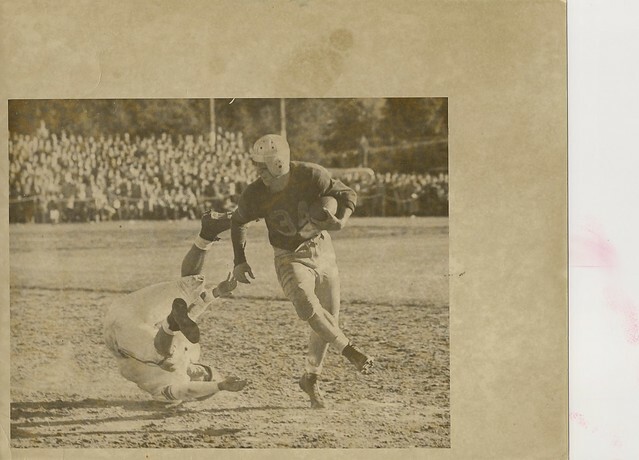 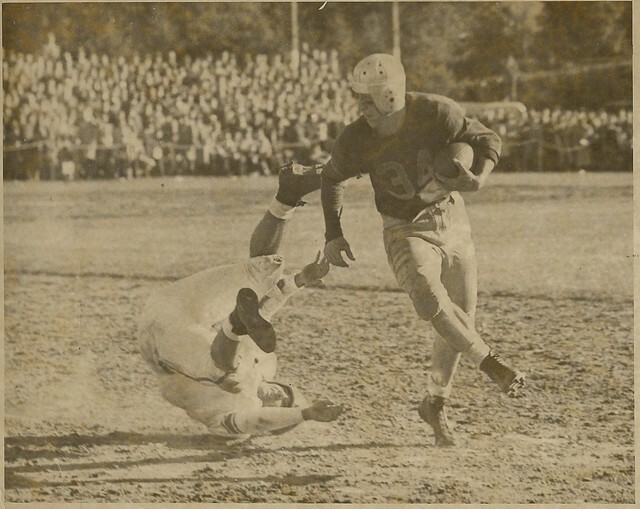 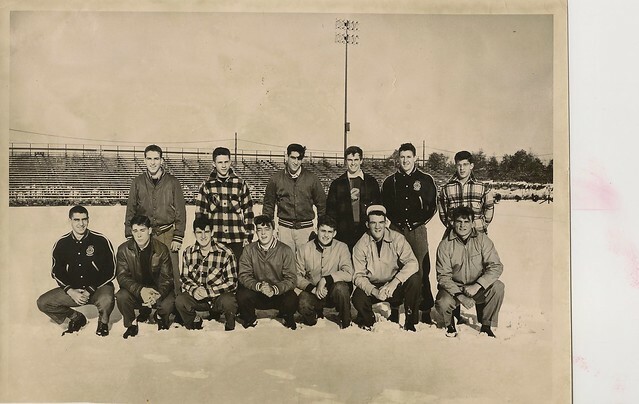 Best known as the elusive fullback on football coach Ray Riddick’s first two Lowell High bowl teams in 1948 and ’49, Reynolds also held the school record in the high jump for 39 years, and as a senior shortstop captained one of Lowell’s best-ever baseball teams. 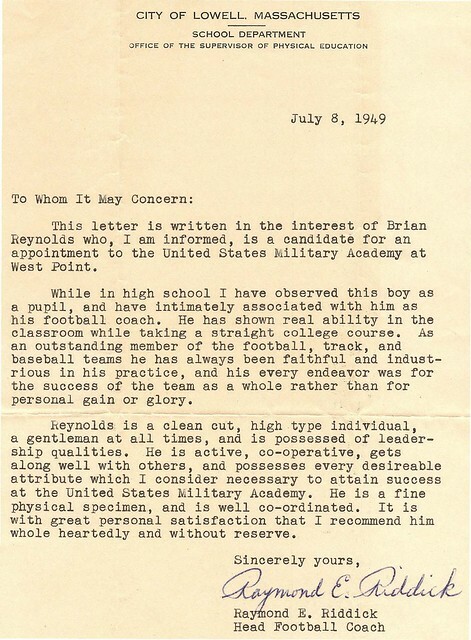 As a teammate, Reynolds made a lasting impression. 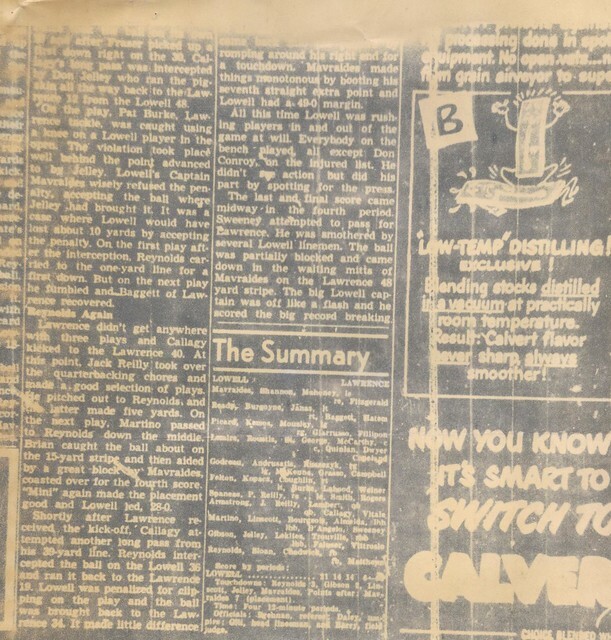 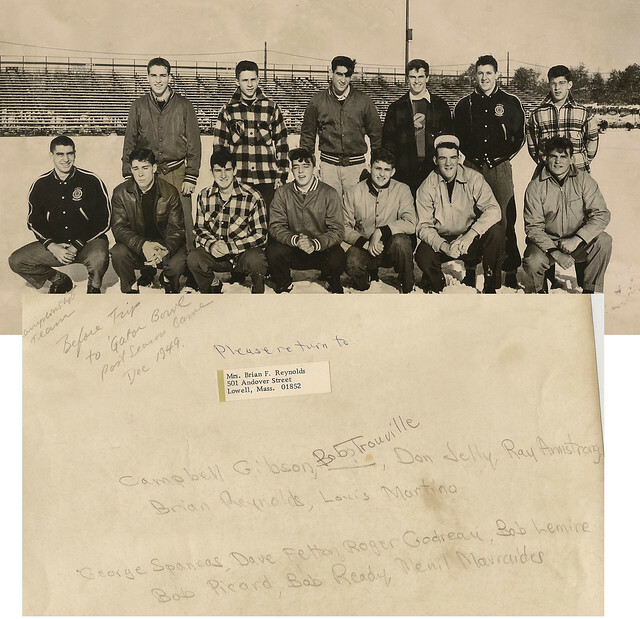 His death Saturday at 66 from brain cancer staggered former teammates sensing their own mortality in the passing of a gentleman who in their eyes remains an unassuming kid from Belvidere carrying out every demand placed on him by taskmaster Riddick. 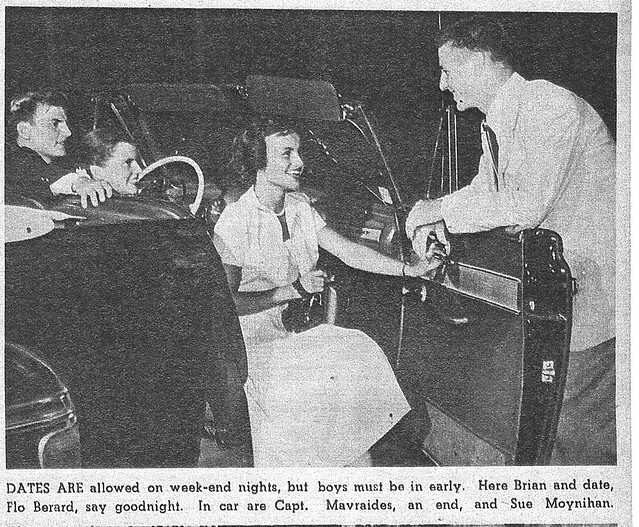 “It’s sad. 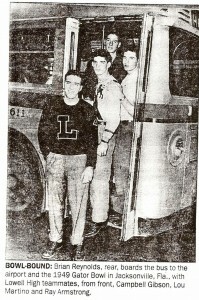 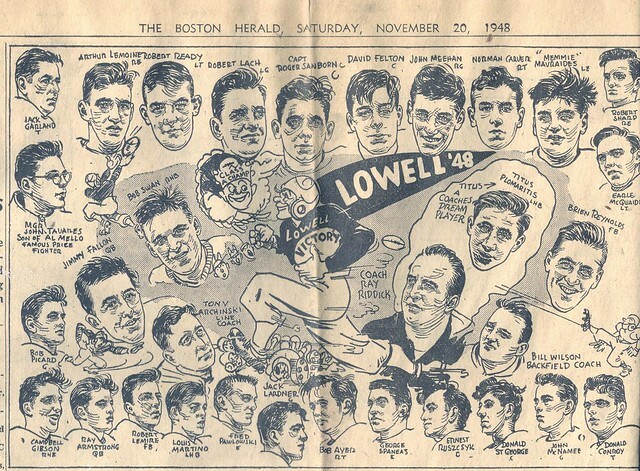 He wasn’t that old,” says Norm Carver, a tackle on those ’48 and ’49 Lowell football powerhouses. 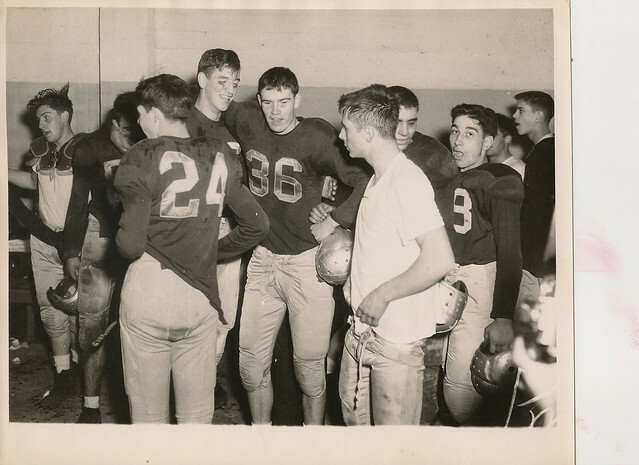 “When you’re young, you think (66) is pretty old. 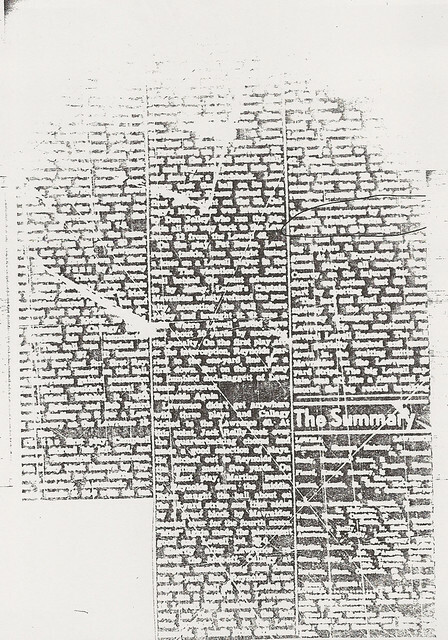 But really it isn’t. 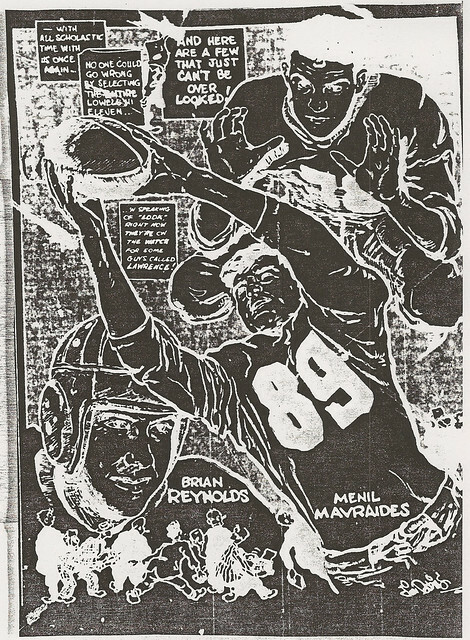 Which sport Reynolds was most natural at depends on which former teammate you talk to. 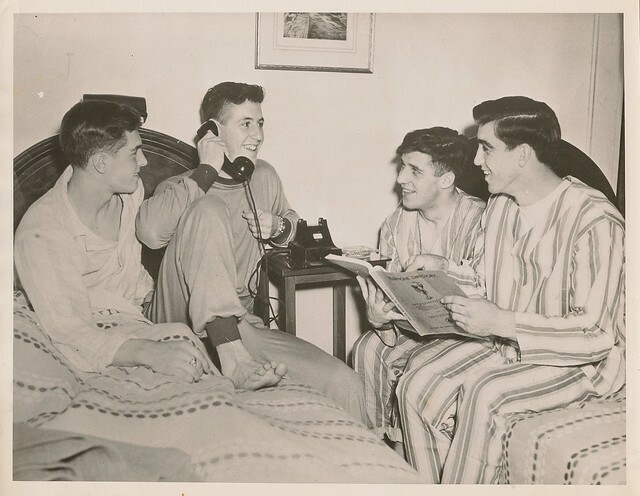 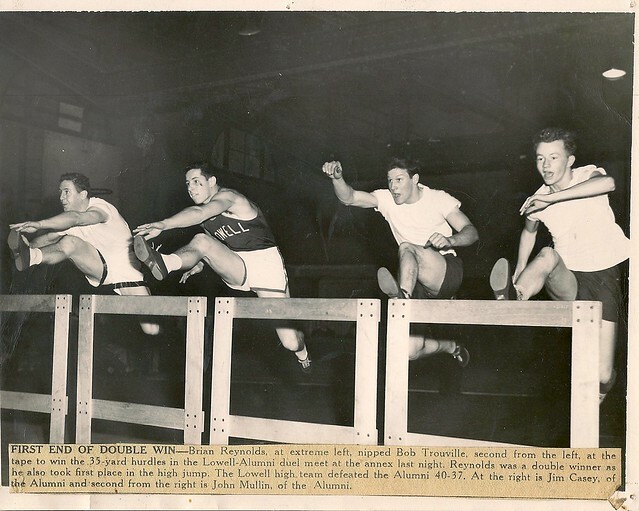 “I remember him being the first guy (at Lowell) to jump the six-foot bar in the high jump,” says Titus Plomaritis, who ran in the same backfield with Reynolds in ’48. 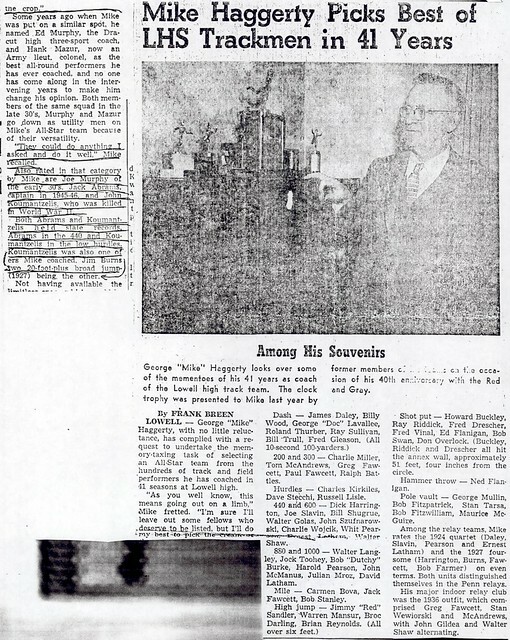 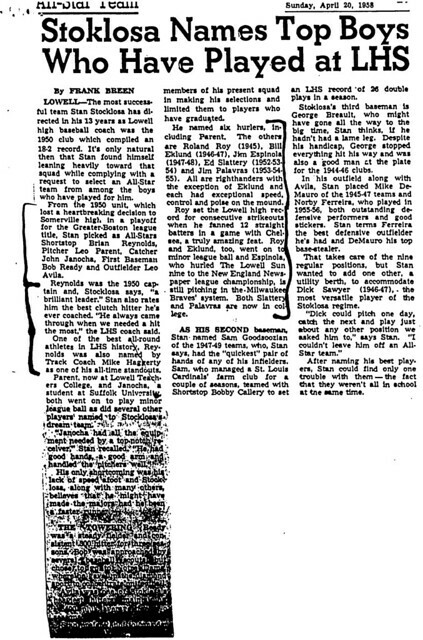 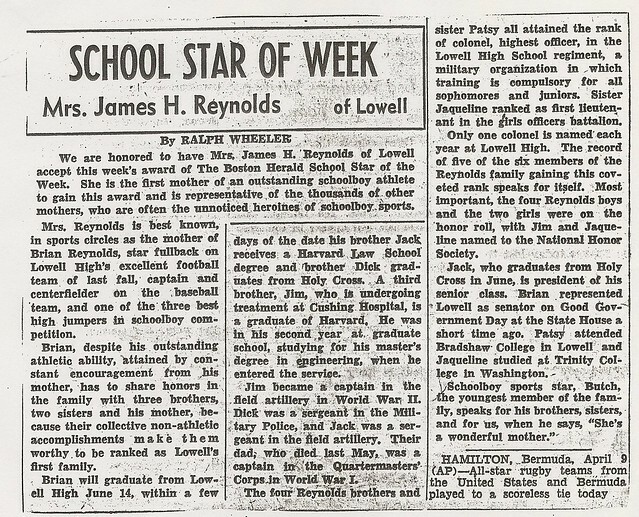 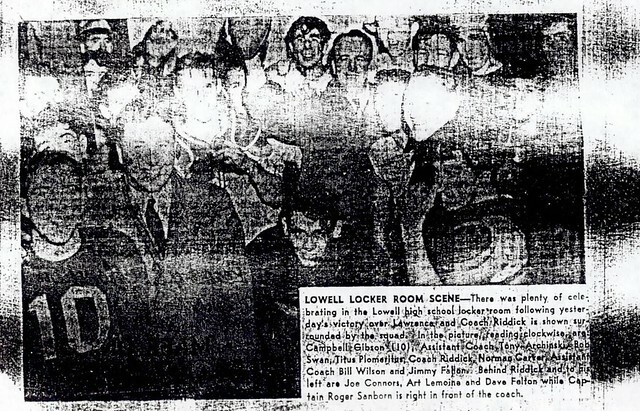 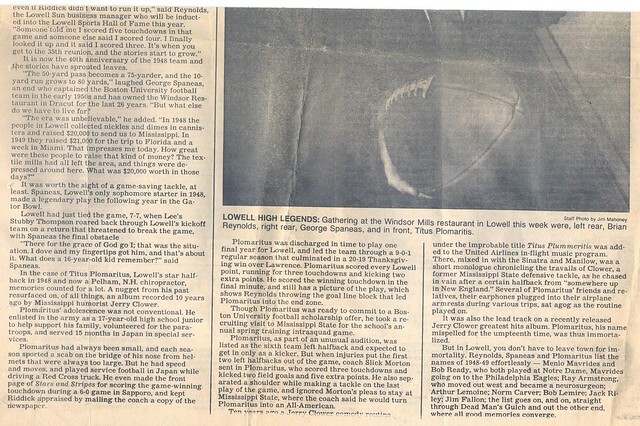 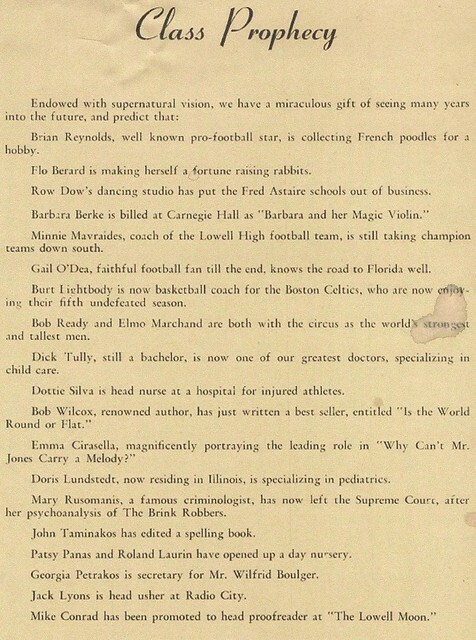 Sam Weisberg, former Sun sportswriter and local schoolboy historian, says Reynolds is one of the five best “all-around athletes” ever at Lowell High. 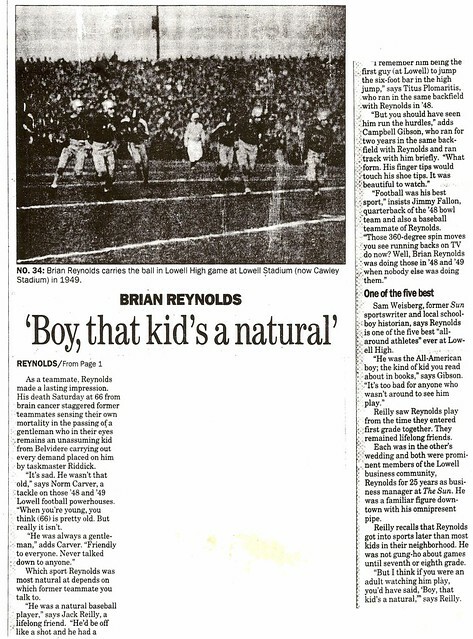 Reilly saw Reynolds play from the time they entered first grade together. 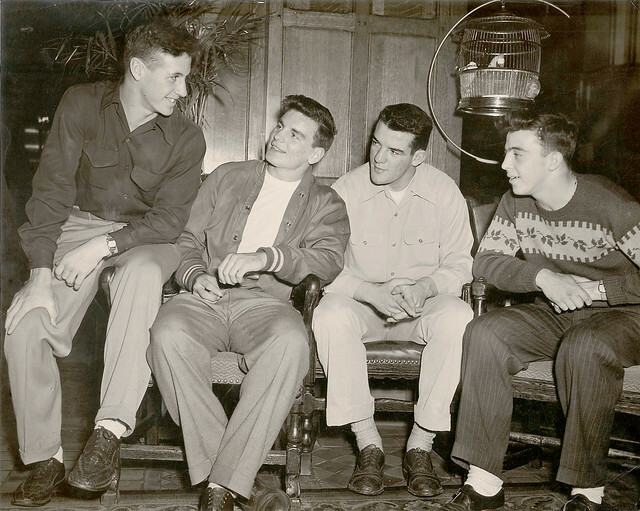 They remained lifelong friends. 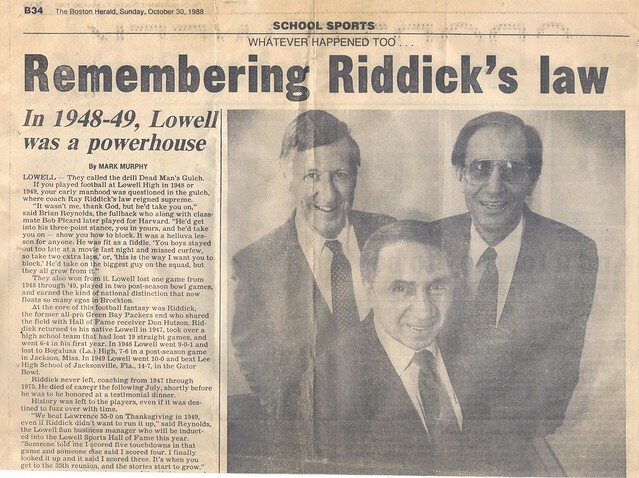 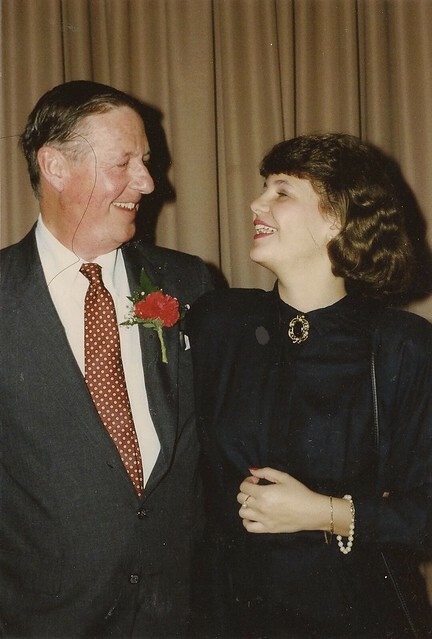 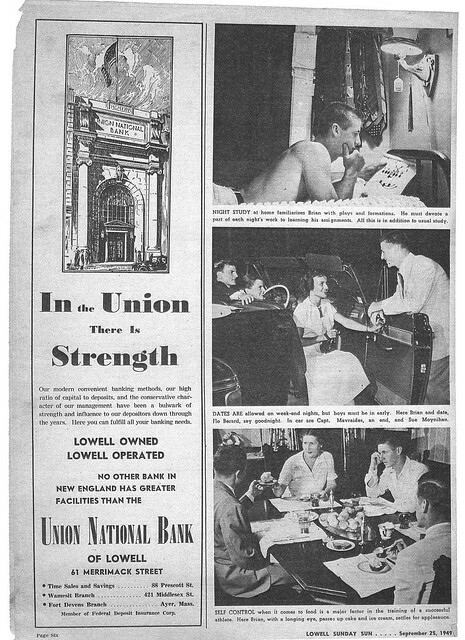 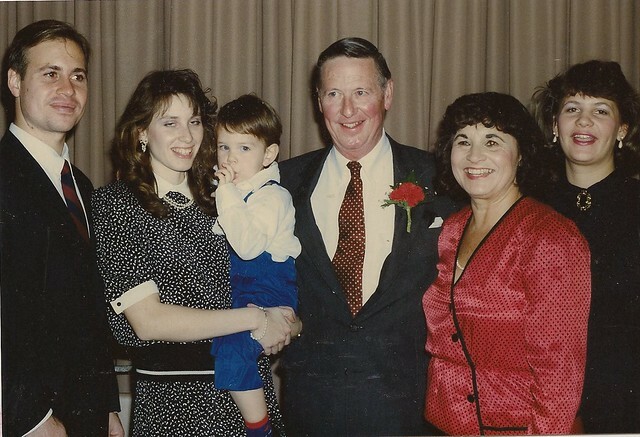 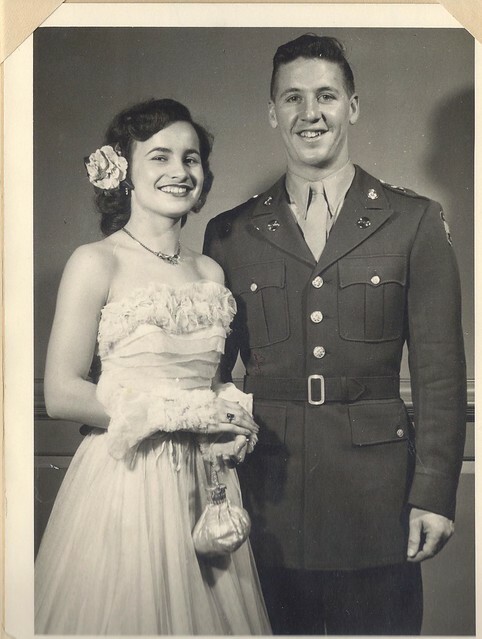 Each was in the other’s wedding and both were prominent members of the Lowell business community, Reynolds for 25 years as business manager at The Sun. 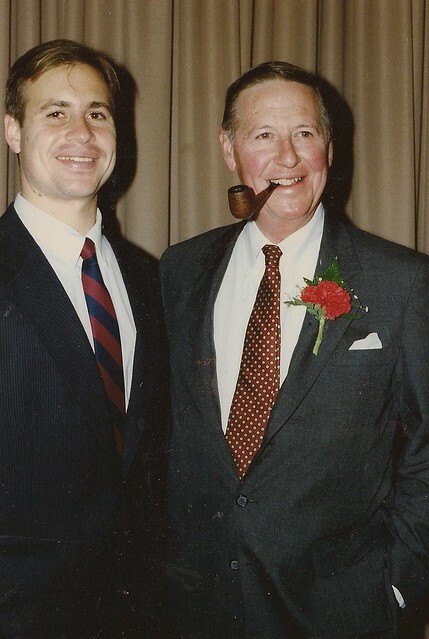 He was a familiar figure downtown with his omnipresent pipe. 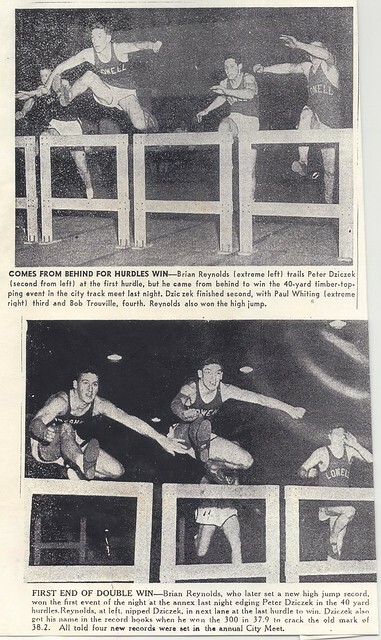 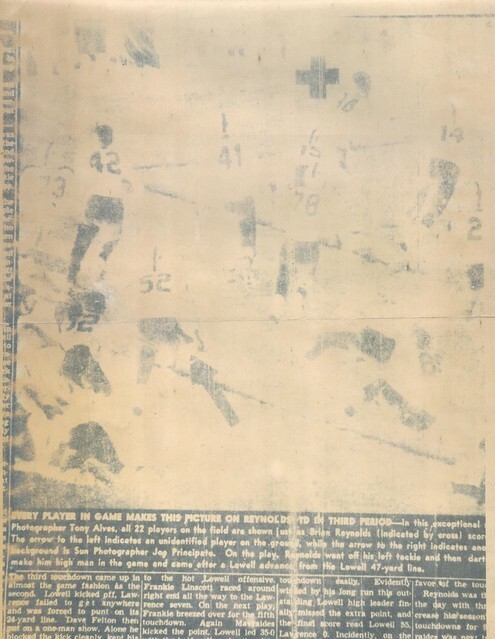 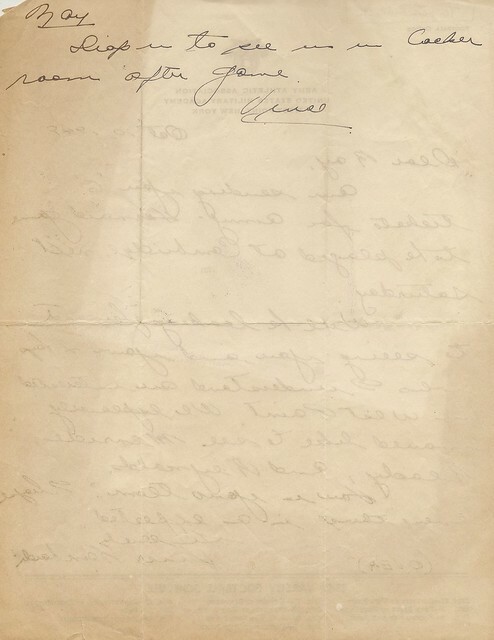 Reilly recalls that Reynolds got into sports later than most kids in their neighborhood. 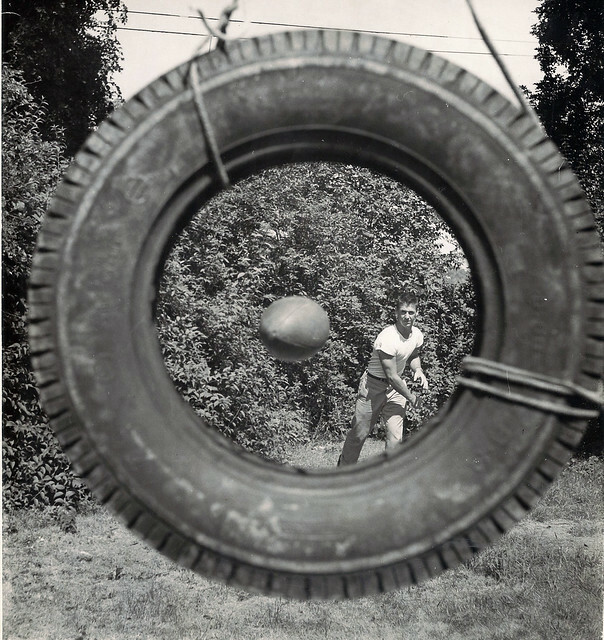 He was not gung-ho about games until seventh or eighth grade. 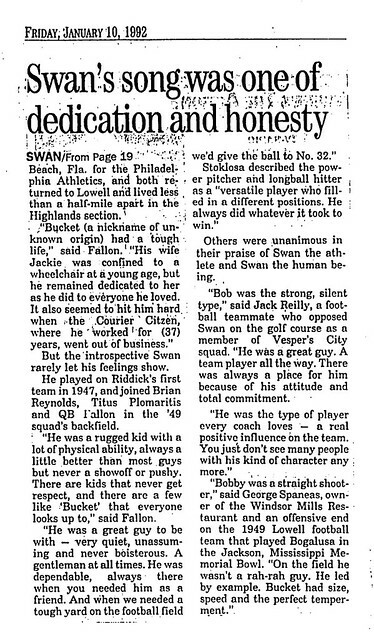 “But I think if you were an adult watching him play, you’d have said, ‘Boy, that kid’s a natural,'” says Reilly. 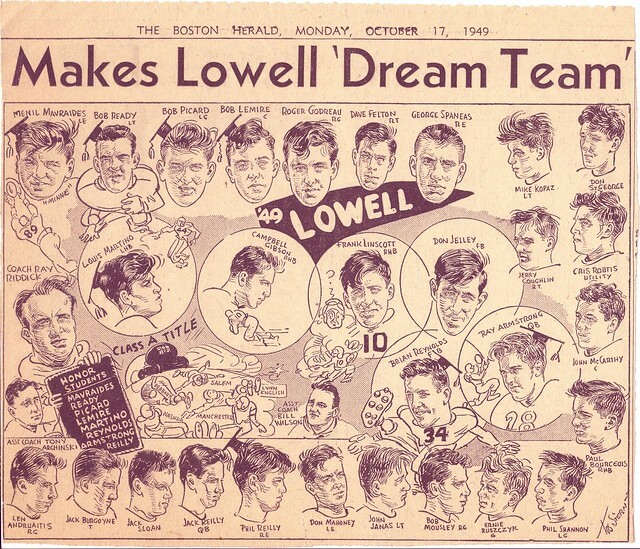 At Lowell High, Reynolds was just that, a virtual three-sport Roy Hobbs. 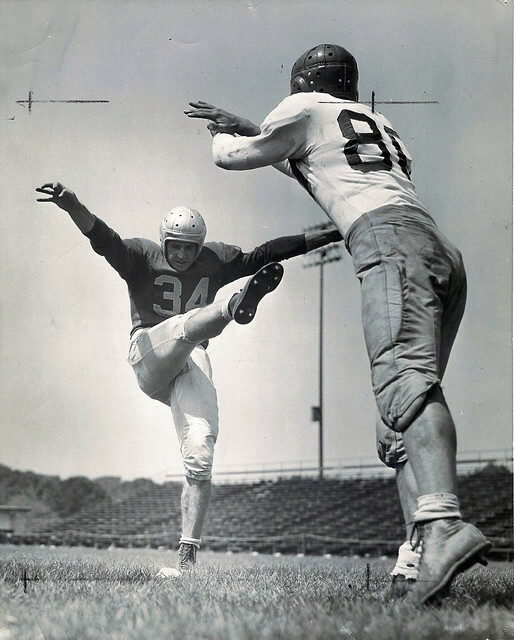 The 6-foot-0, 170-pounder earned nine varsity letters. 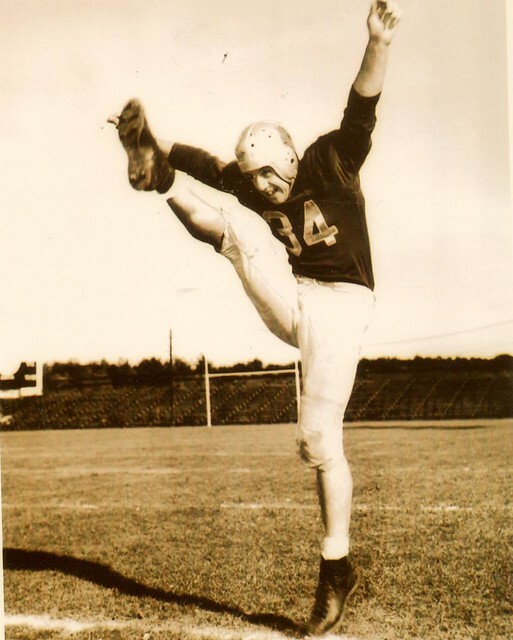 As a senior, he was All-Scholastic in football and track and also honorable-mention All-American in football. 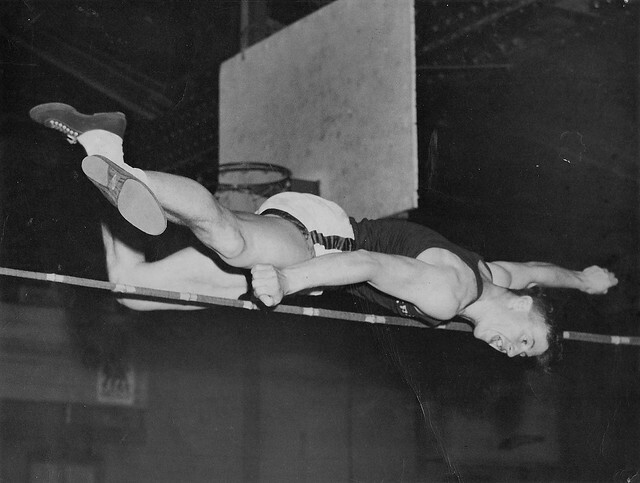 His school-record high jump of 6-foot-1 stood for 39 years. 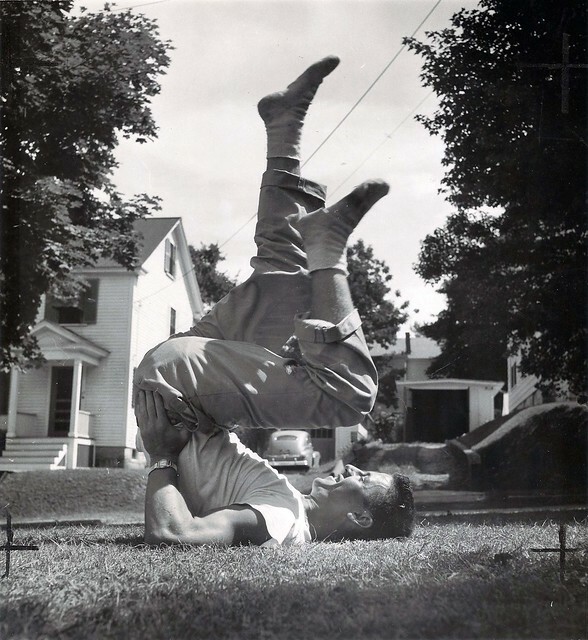 His gracious spirit should stand forever. 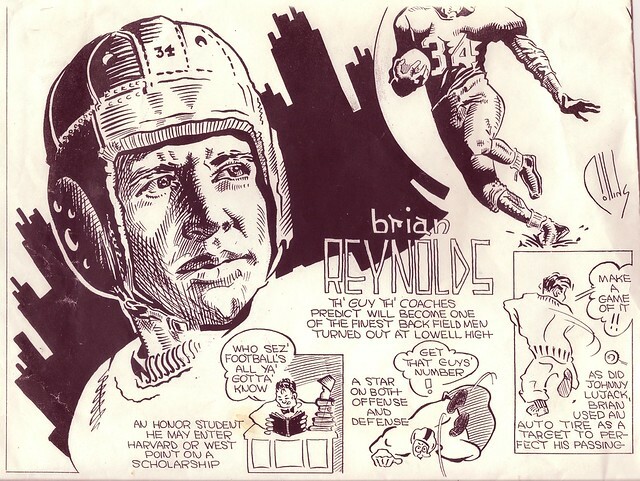 Reynolds not only played the games like few others, he played them as they should be played. 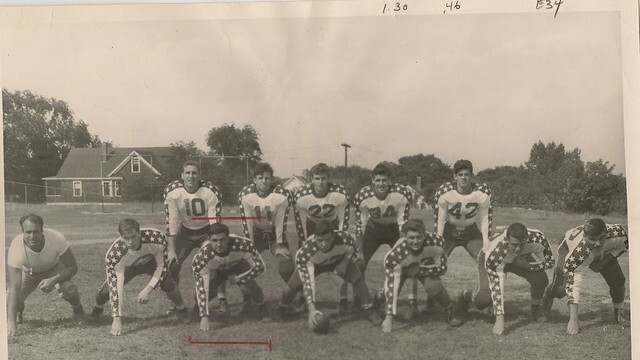 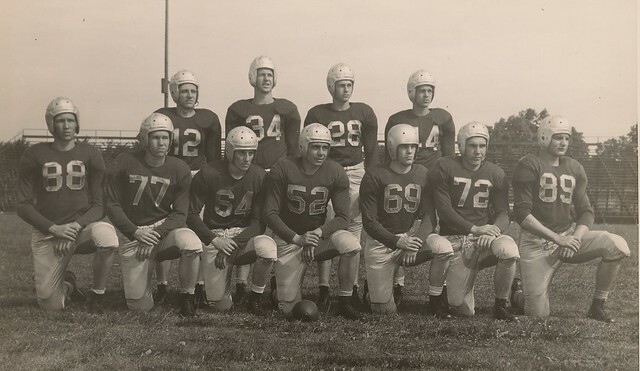 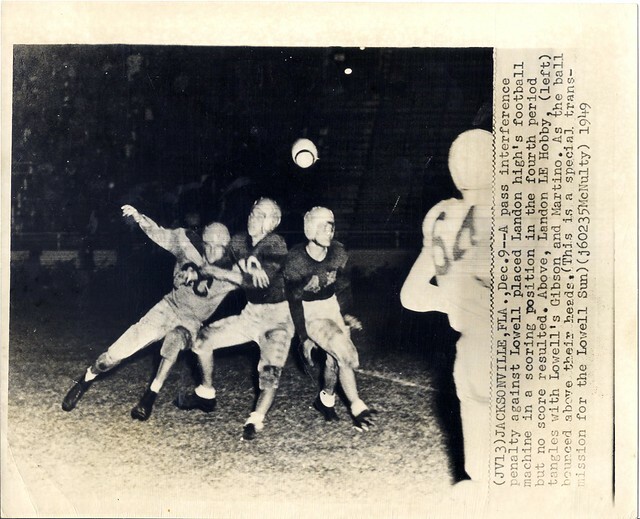 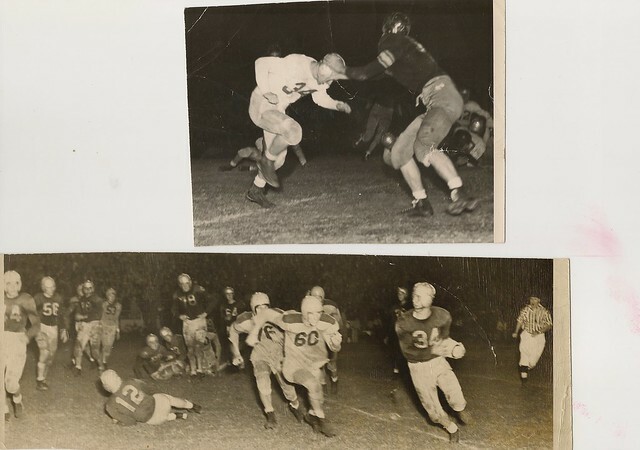 Reynolds was a major contributor to the ’48 team, which finished its regular season 9-0-1 before losing 12-7 to Bogalusa High in the Memorial Bowl in Jackson, Miss. 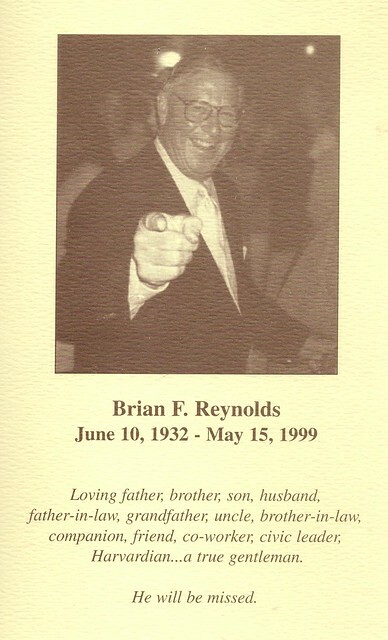 The following season Reynolds was a star. 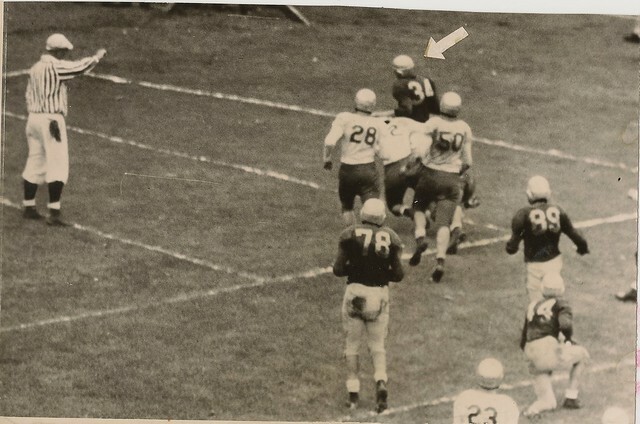 He just didn’t act like one. 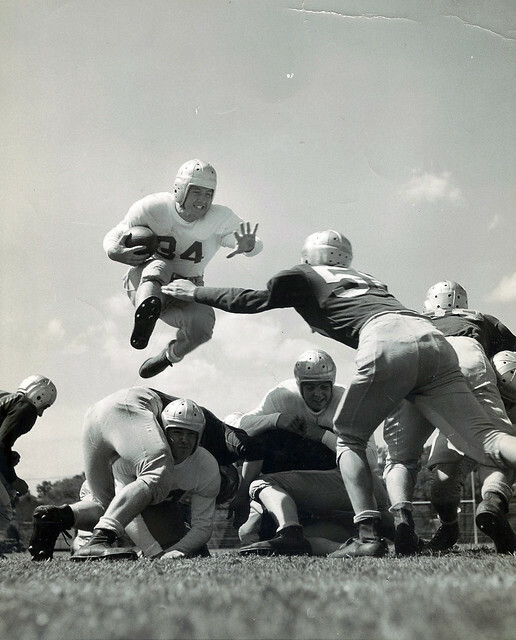 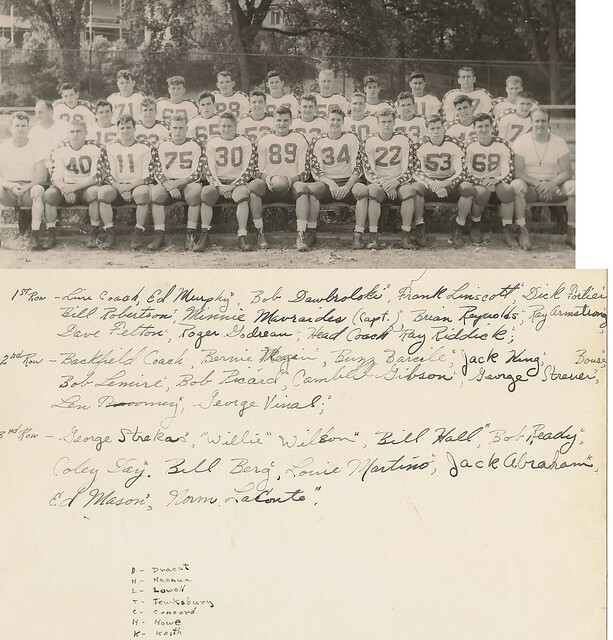 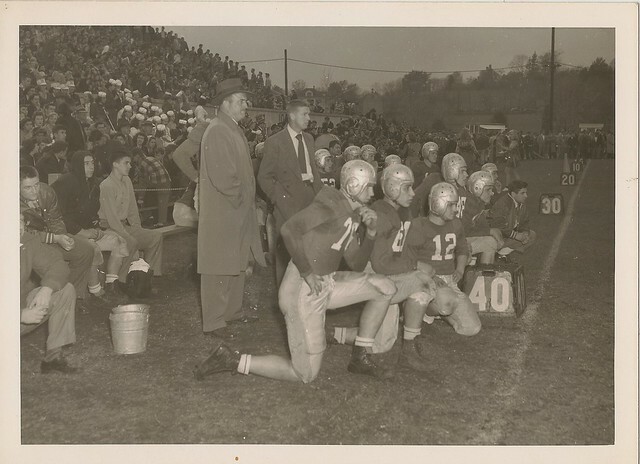 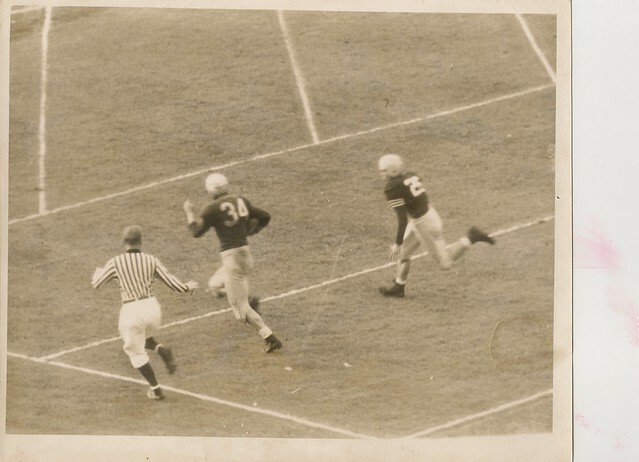 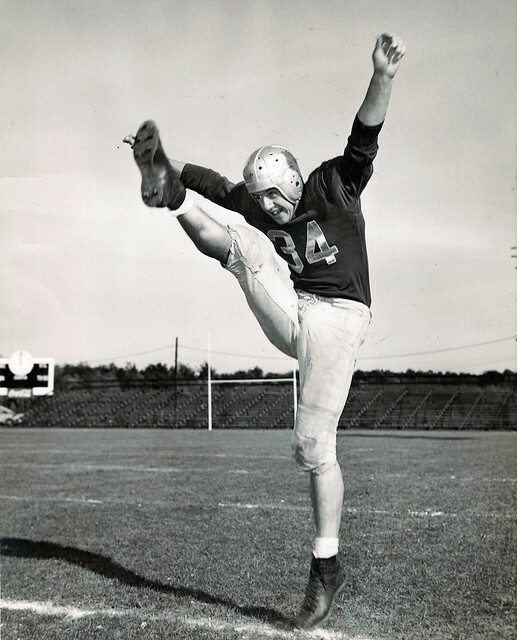 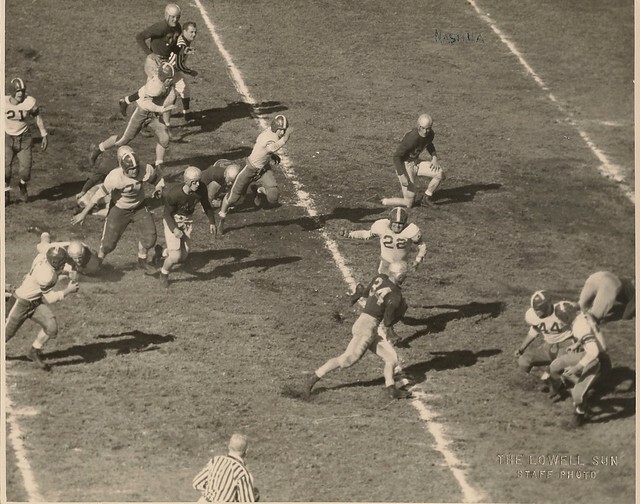 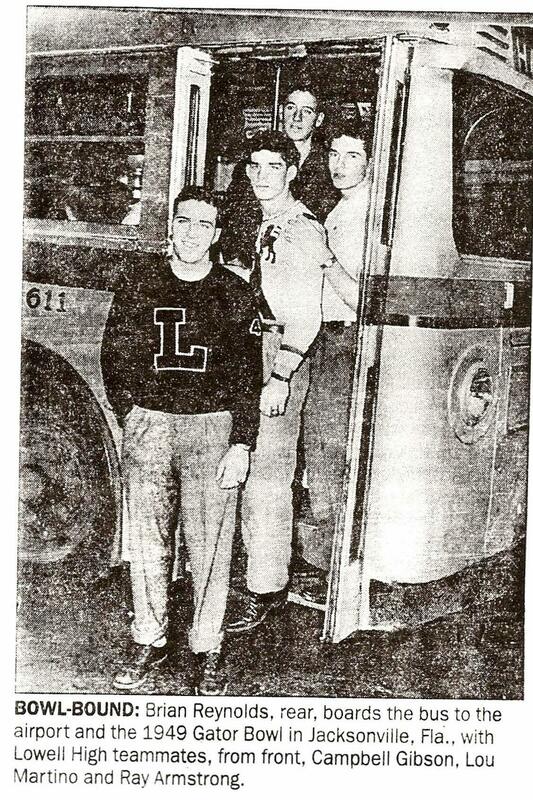 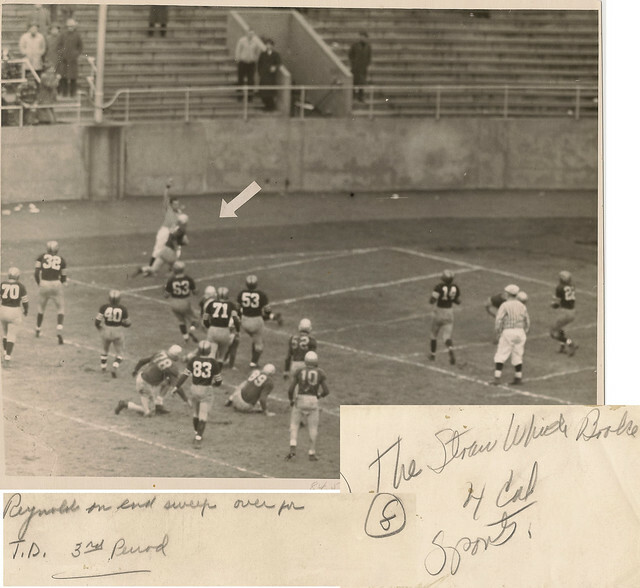 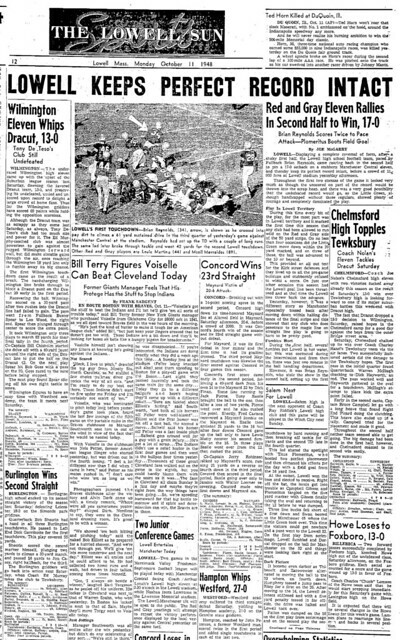 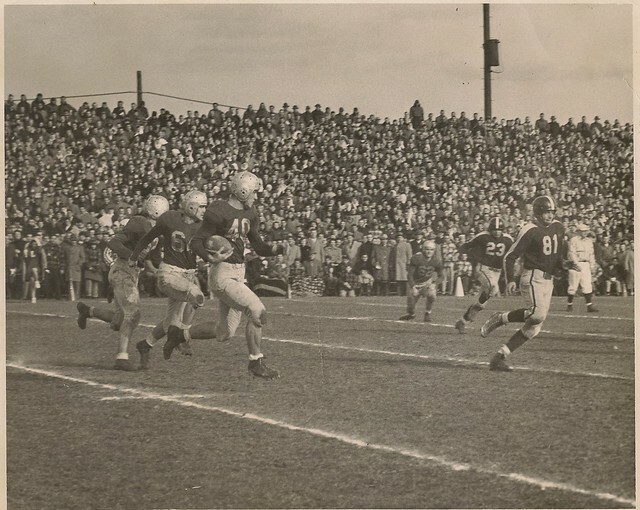 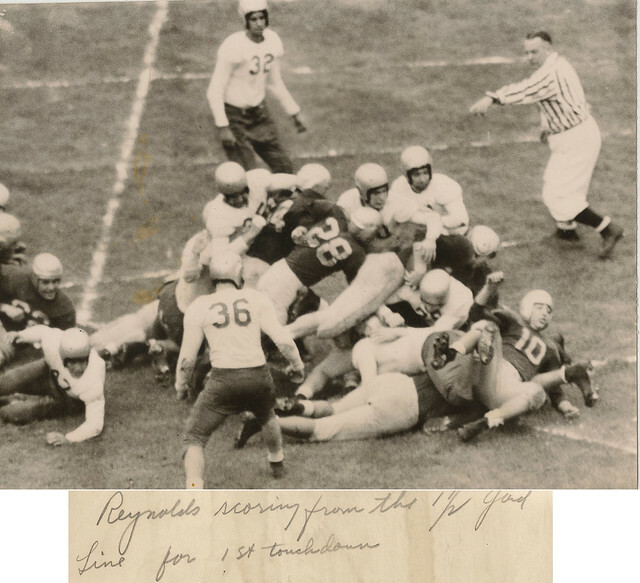 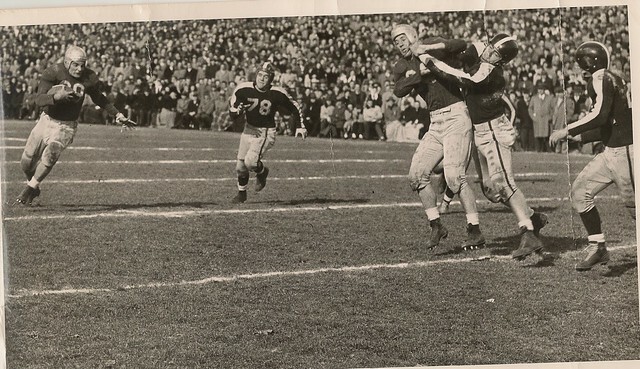 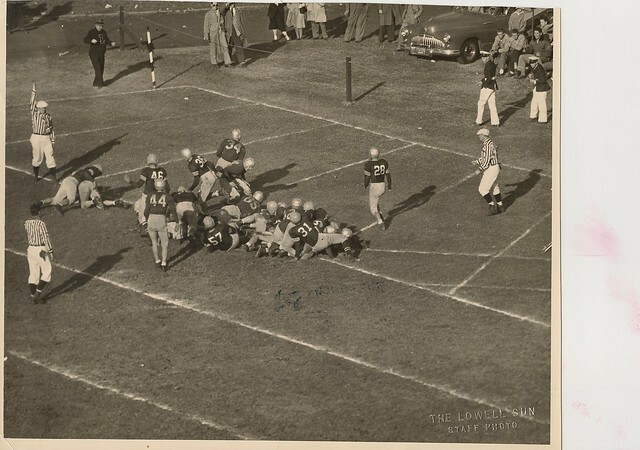 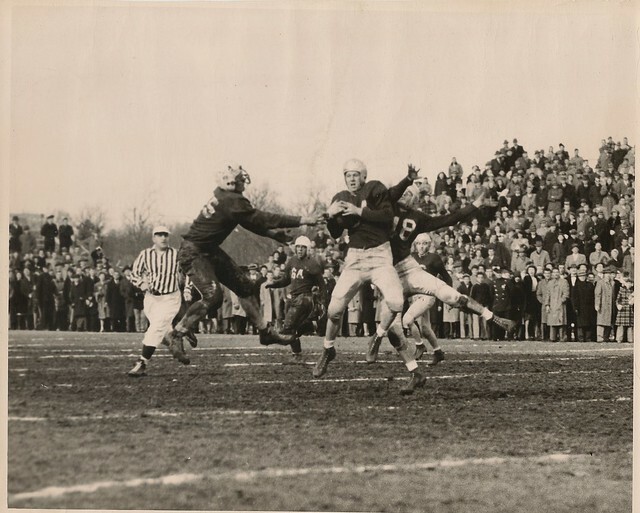 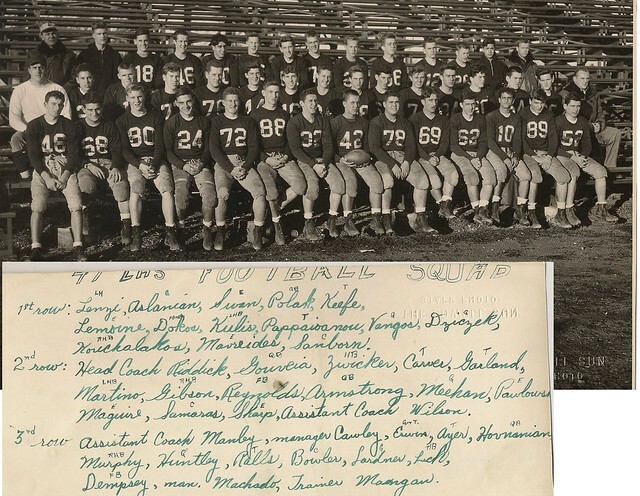 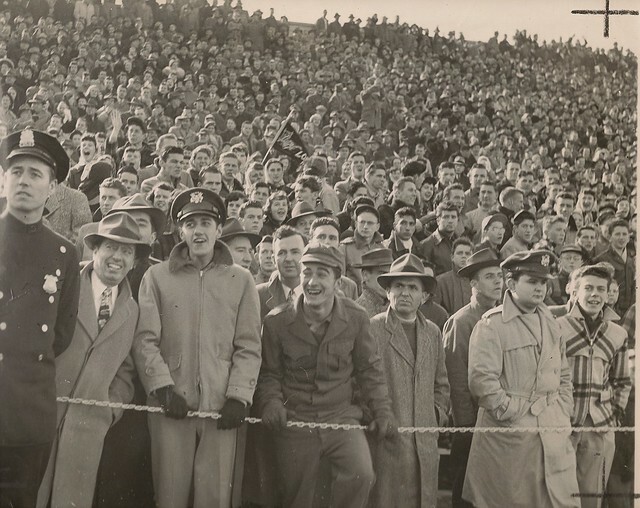 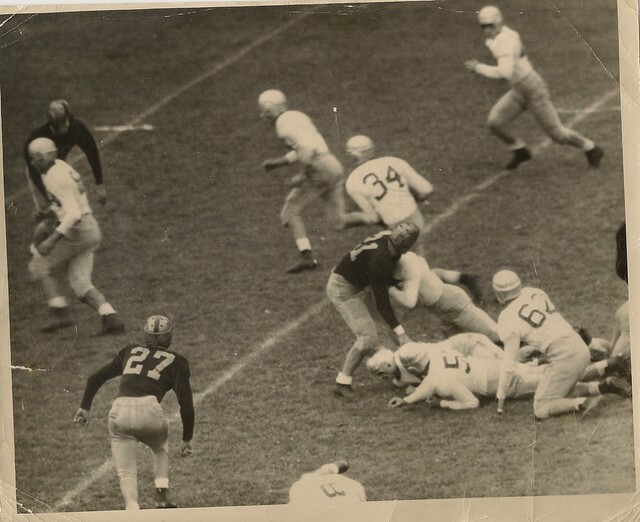 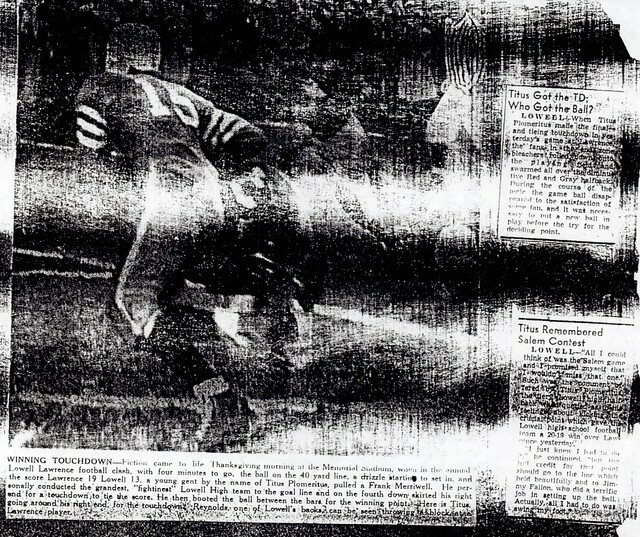 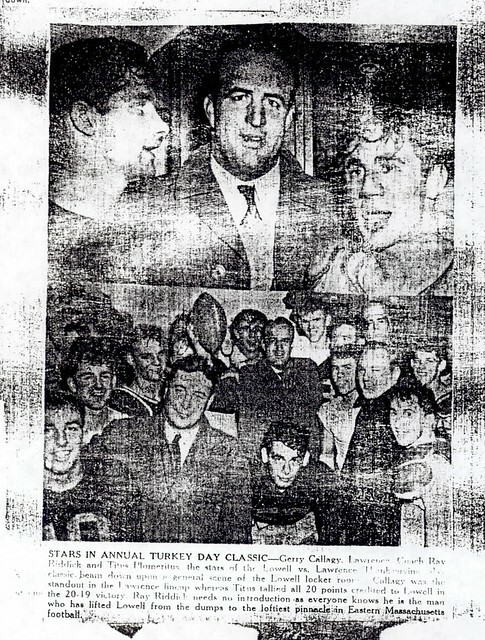 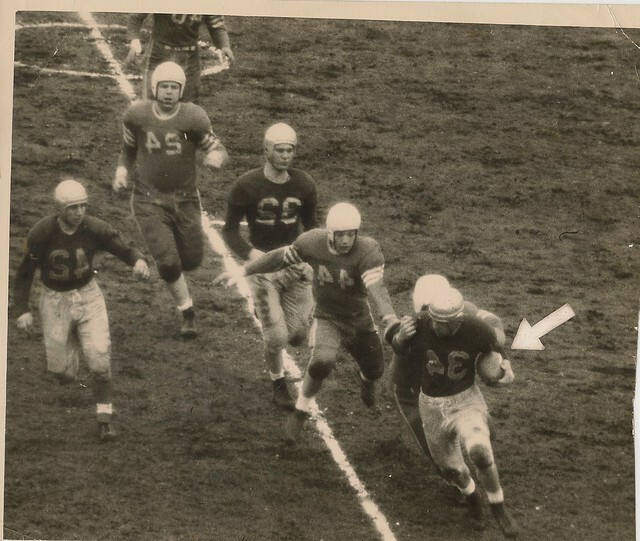 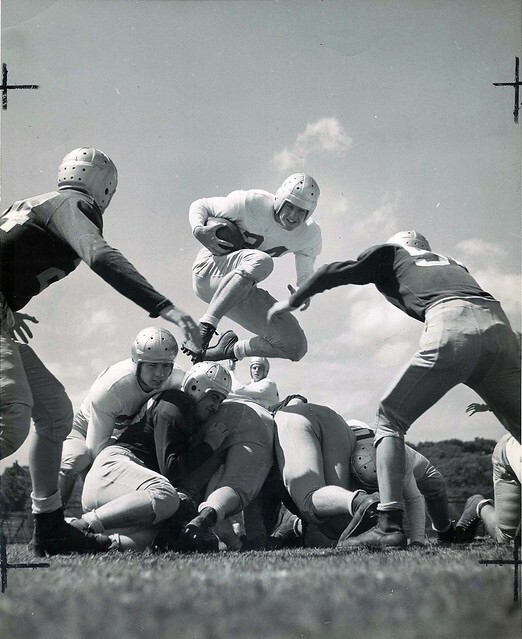 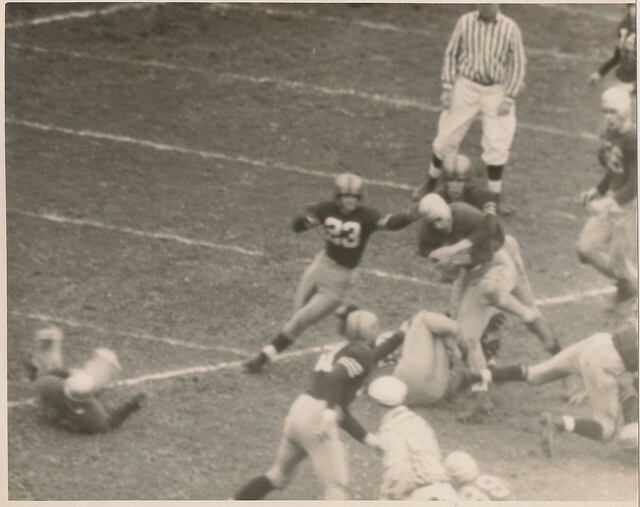 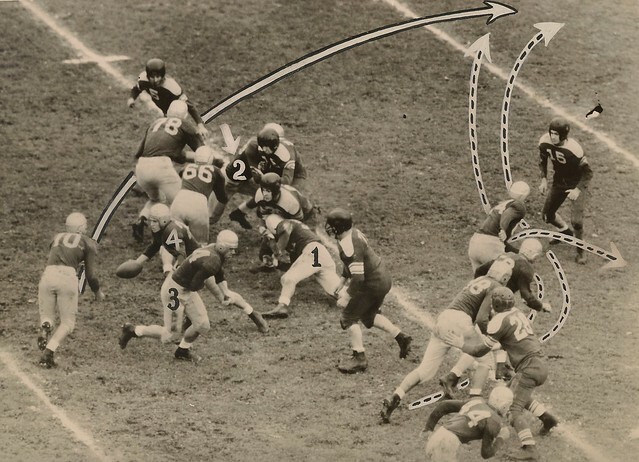 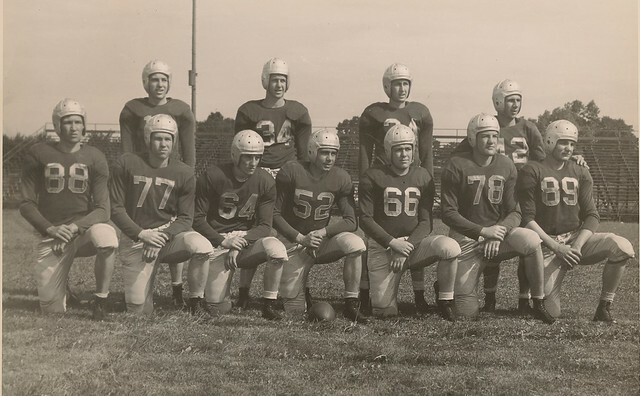 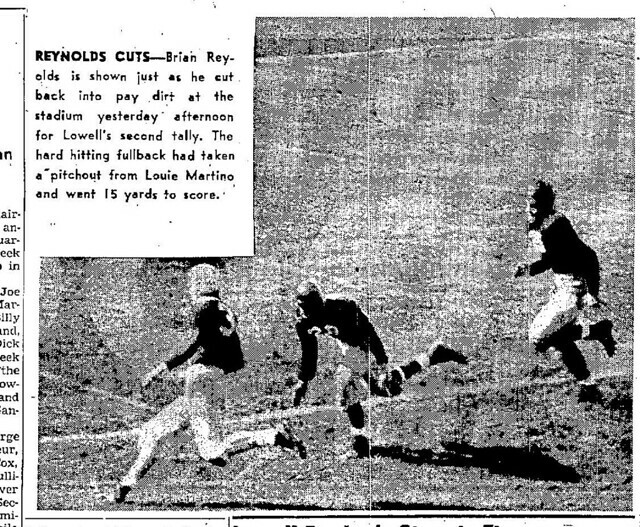 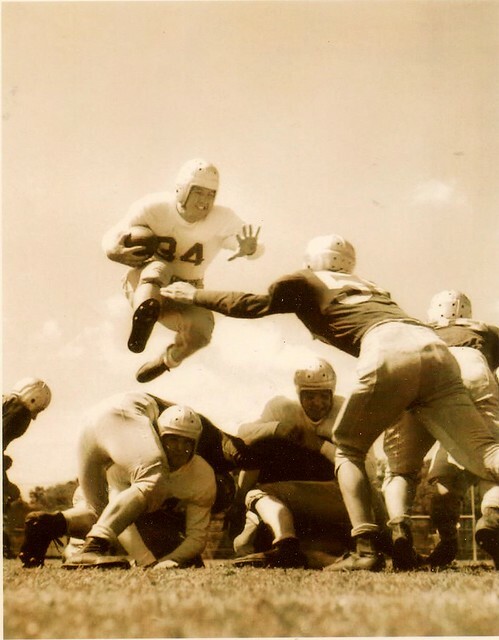 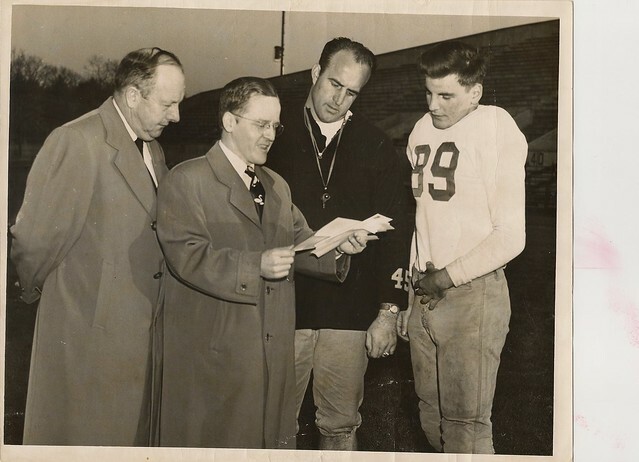 In ’49, Reynolds scored 102 points, including three touchdowns in a 55-0 rout of Lawrence on Thanksgiving Day. 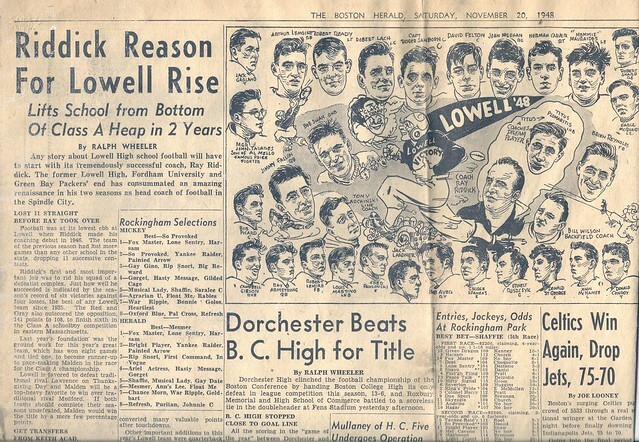 Lowell finished 10-0. 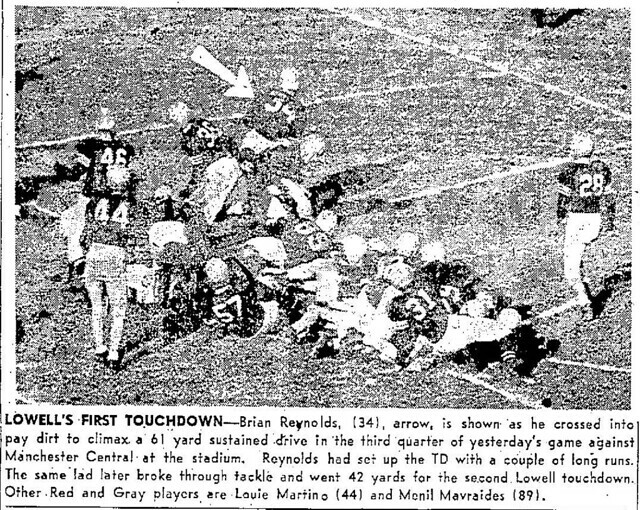 Reynolds then caught a touchdown pass in the Red Raiders’ 14-7 victory over Landon High in the Gator Bowl in Jacksonville, Fla.
Reynolds might also have been the best punter in LHS history, according to Weisberg. 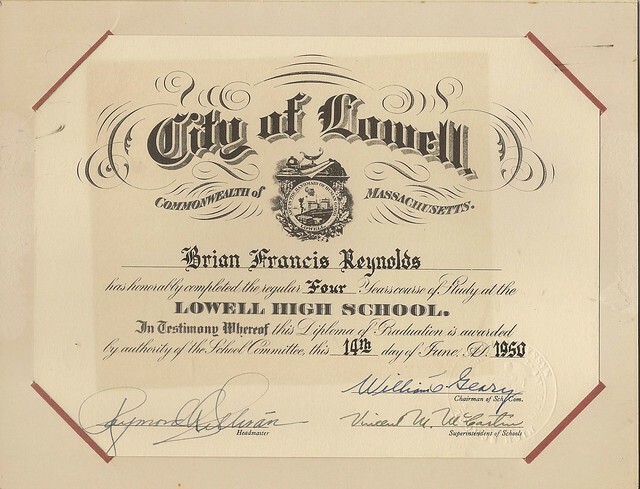 In baseball, Reynolds played right field for two seasons before becoming Lowell’s starting shortstop and captain as a senior. 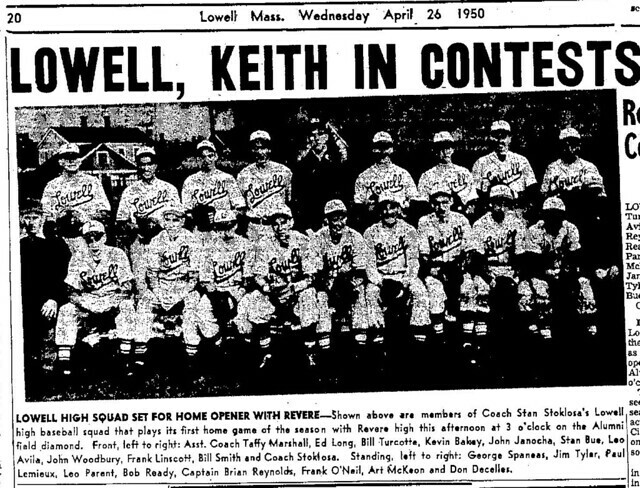 Stan Stoklosa, who coached Lowell High baseball for 24 years, considers that 1950 team captained by Reynolds the best he ever had. 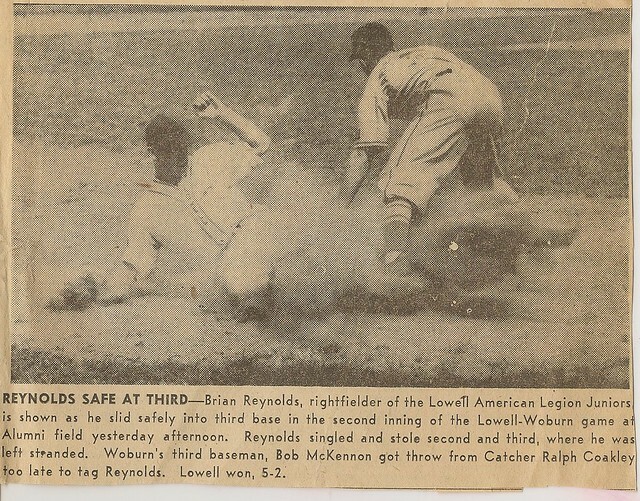 Alumni Field’s upkeep was lacking in those days, so Reynolds took it upon himself on weekends to mow the law, rake the infield and fill in holes around the mound and plate. 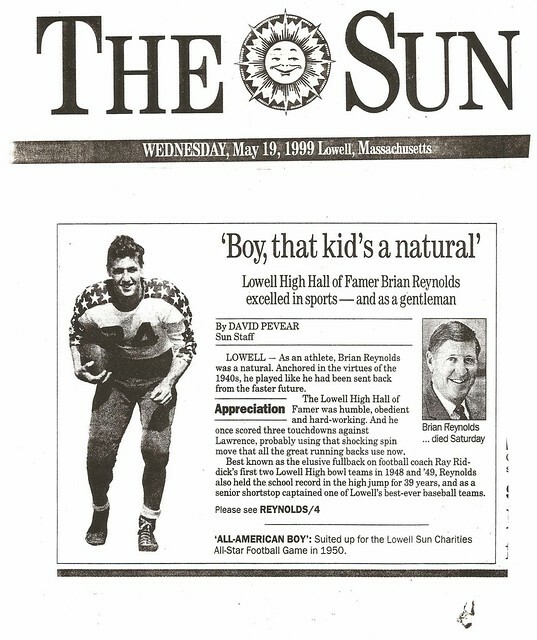 Reynolds suffered a broken collarbone in the Lowell Sun Charities All-Star Football after his senior year. 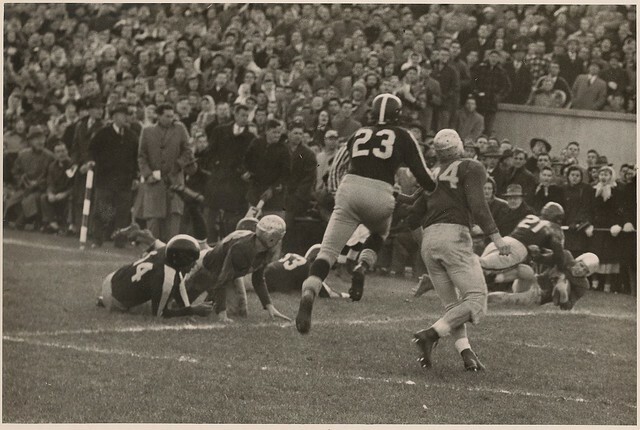 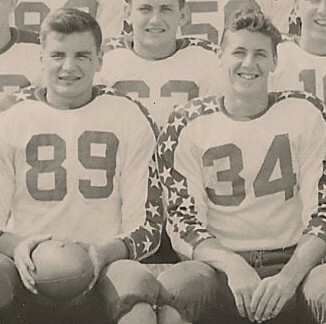 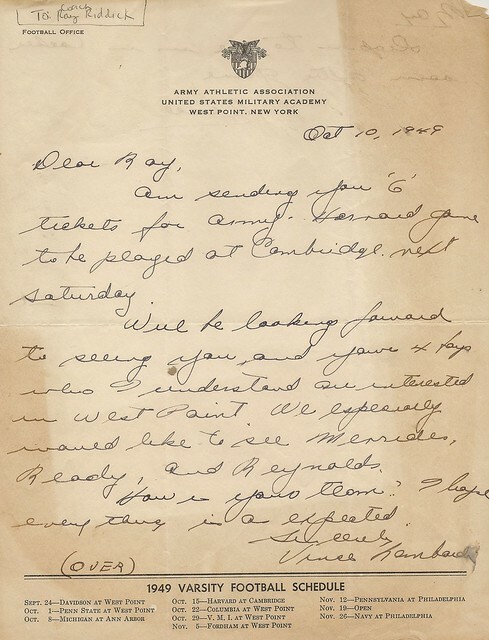 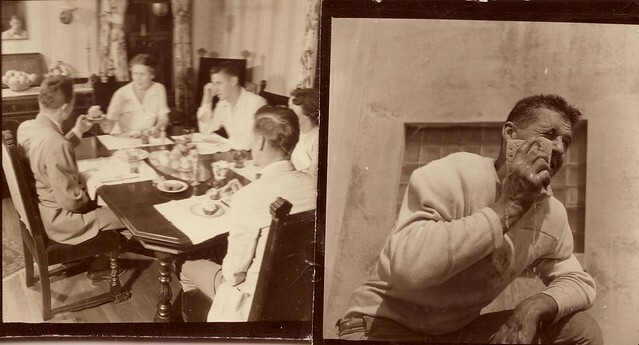 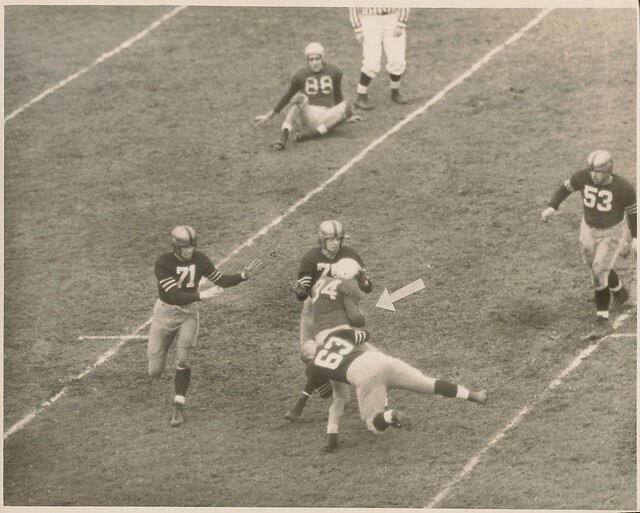 He went on to Harvard University (Class of ’54), where he played mostly defensive back, starting for three seasons. 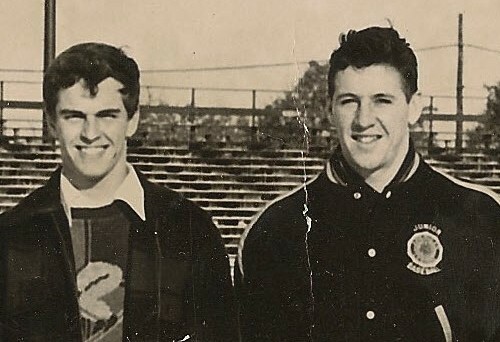 He was also on Harvard’s varsity track team for three years. 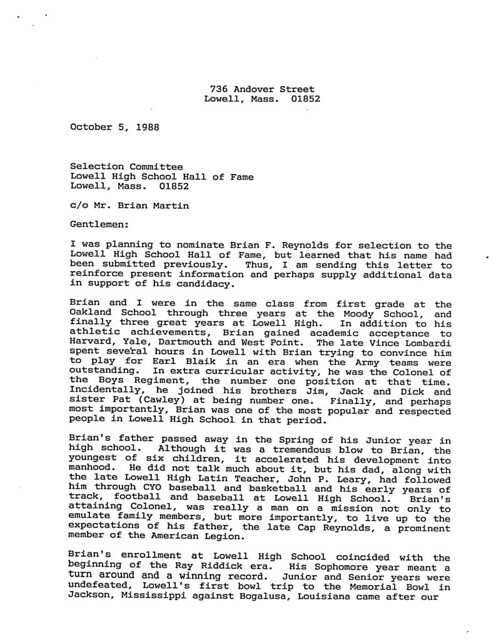 He didn’t go out for the baseball team at Harvard. 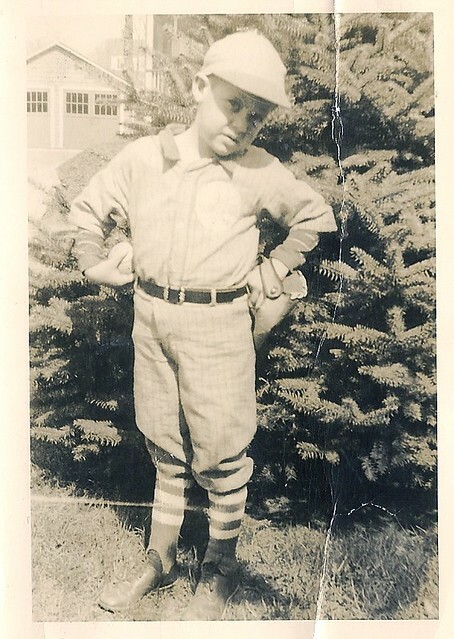 But one day coach Stuffy McInnis saw Reynolds shagging flies on a yonder field and invited this natural-looking ballplayer to join the team. 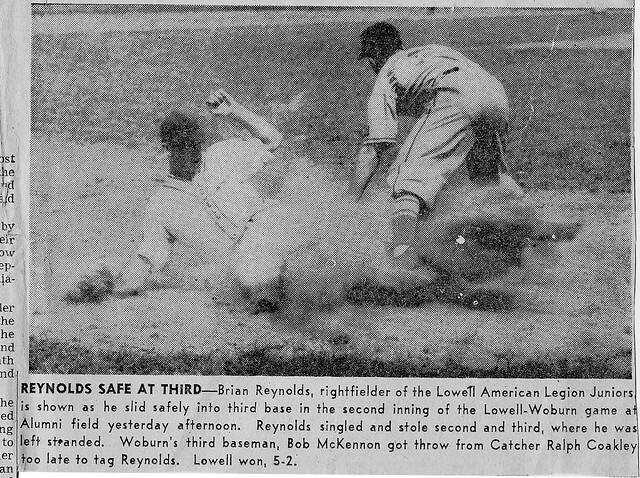 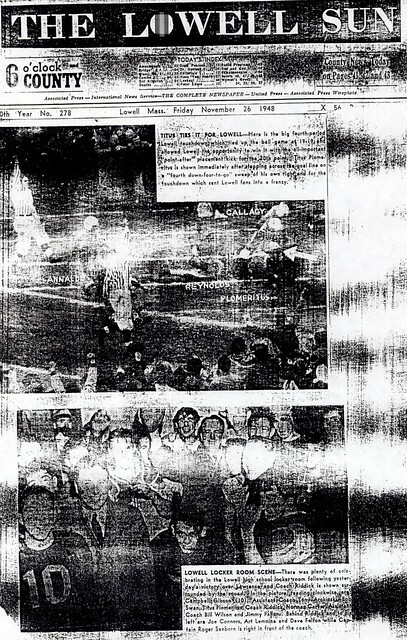 Reynolds would later score the winning run against Yale. 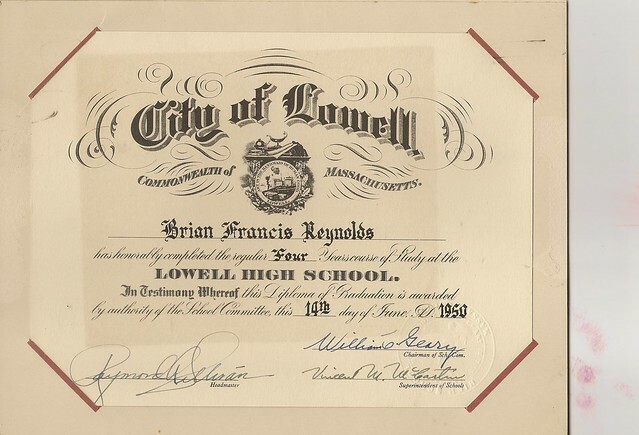 Lowell High Hall of Famer Brian Reynolds excelled in sports — and in life.